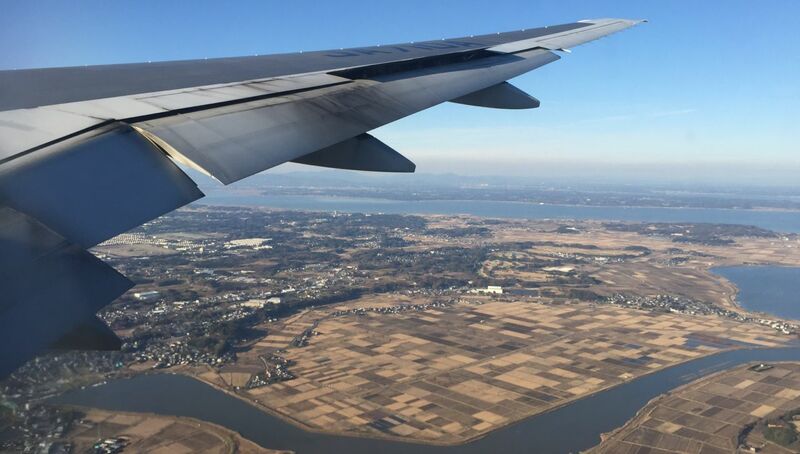 Over the holidays we flew back to the United States to visit family. 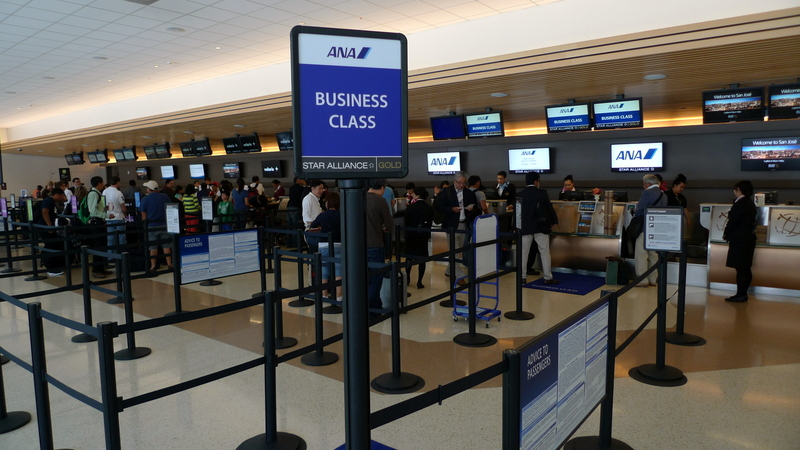 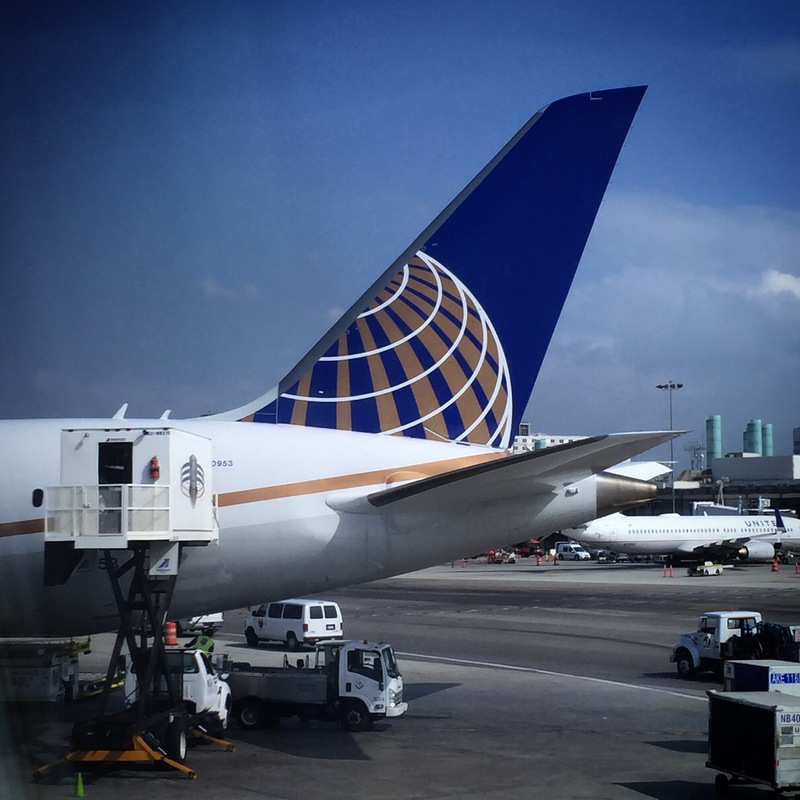 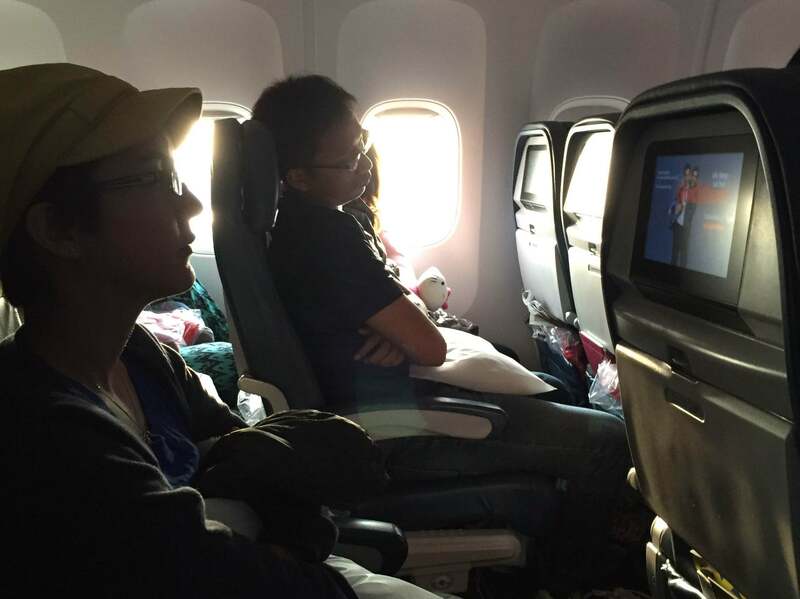 Comparing all the options, we chose All-Nippon Airways, a Japanese airline and member of the Star Alliance, because with their joint venture with United, it was easy to seamlessly book the entire trip through ANA’s website. 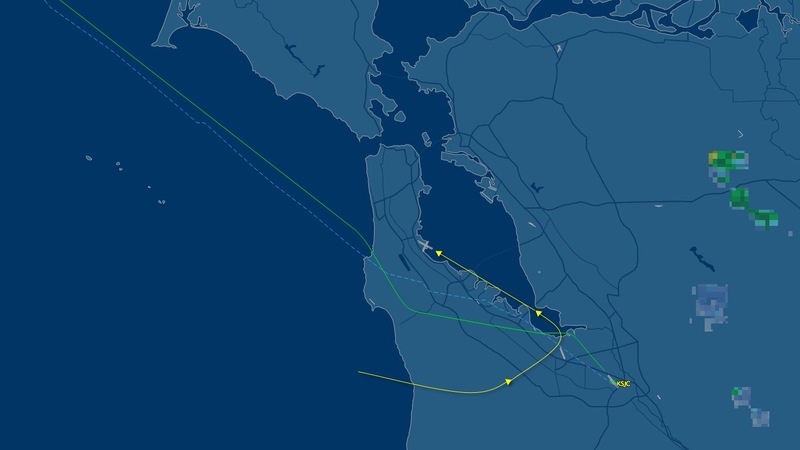 Here is a look at the highlights of the flights. 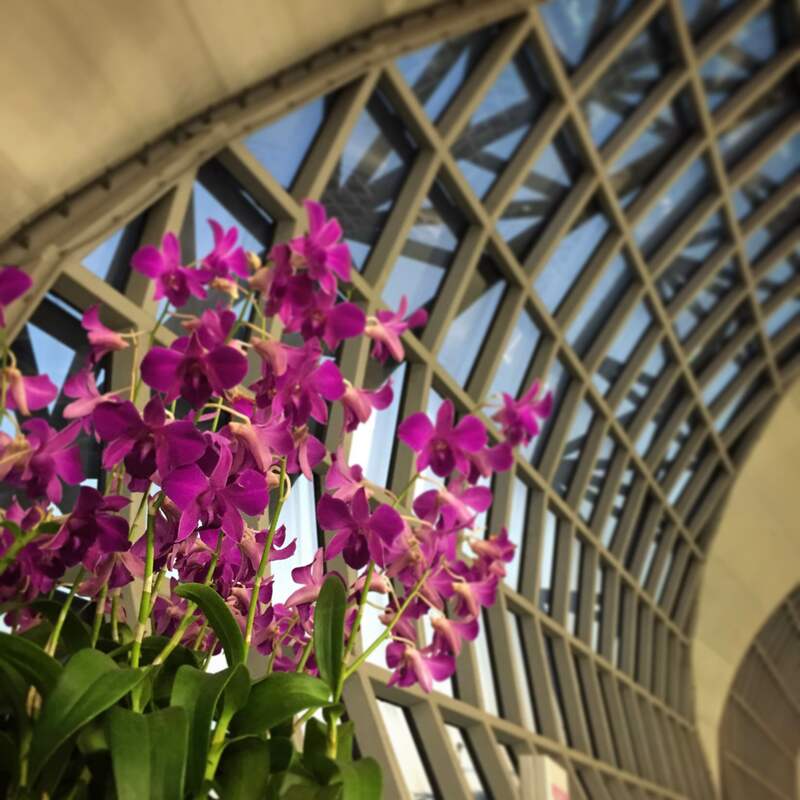 The departure from Bangkok’s Suvarnabhumi International Airport is quite early – about 7:00 – but we arrived early enough beforehand so we could enjoy some time in the THAI Airways Royal Orchid Lounge. 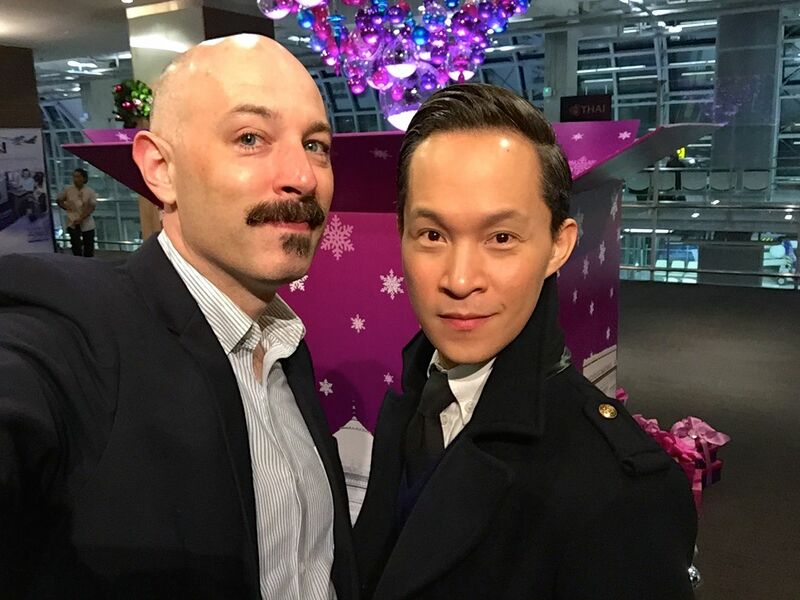 The lounge was decorated for the holidays in shades of their signature purple hue. 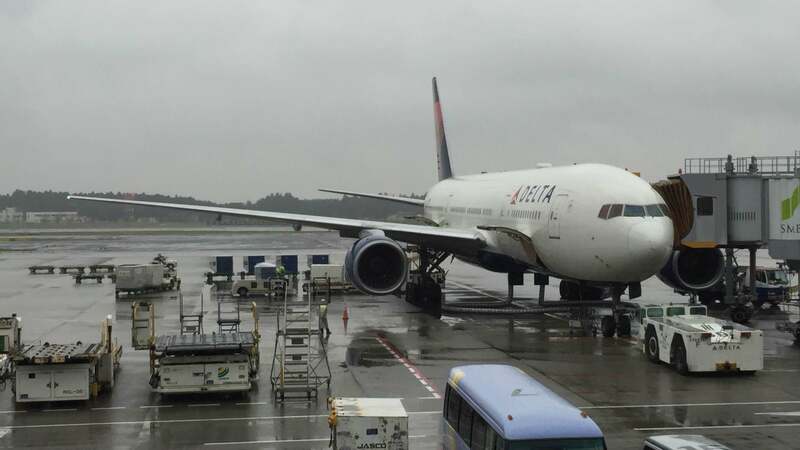 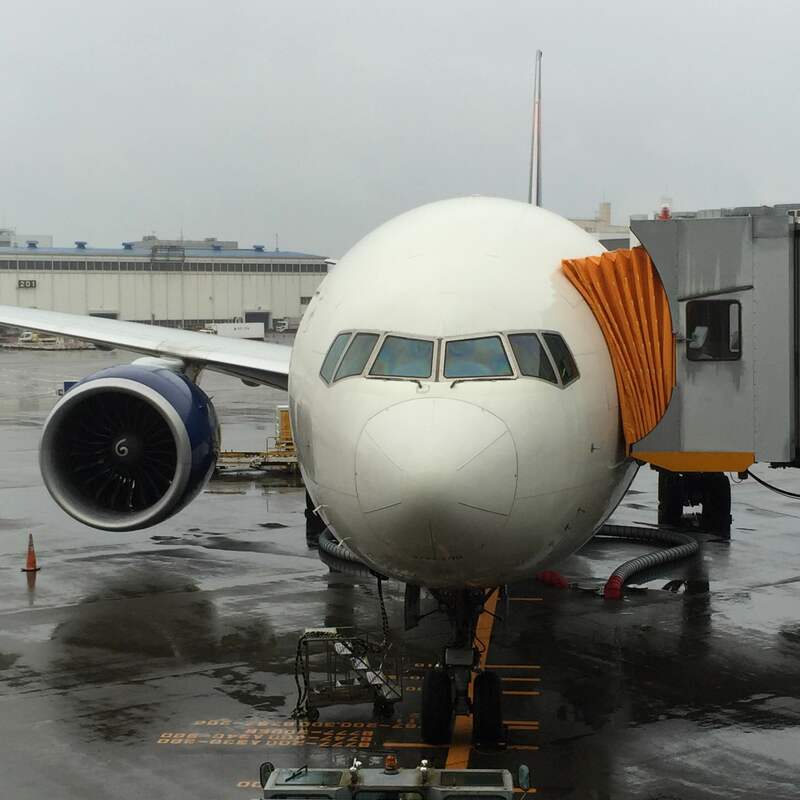 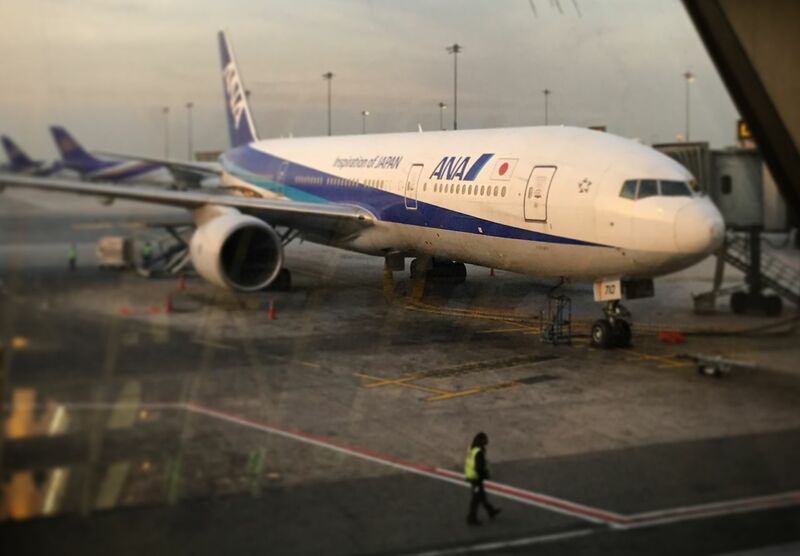 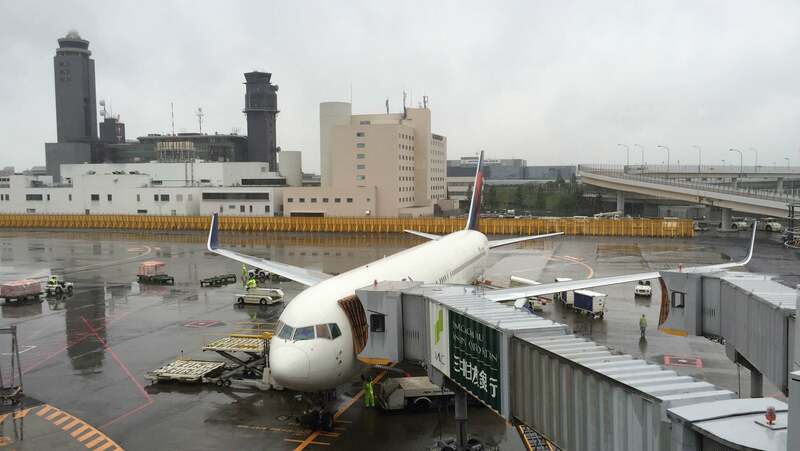 Now that United has exited the Bangkok to Tokyo route, leaving the flying to All-Nippon, ANA has up-gauged their equipment from a Boeing 767 to a Boeing 777. 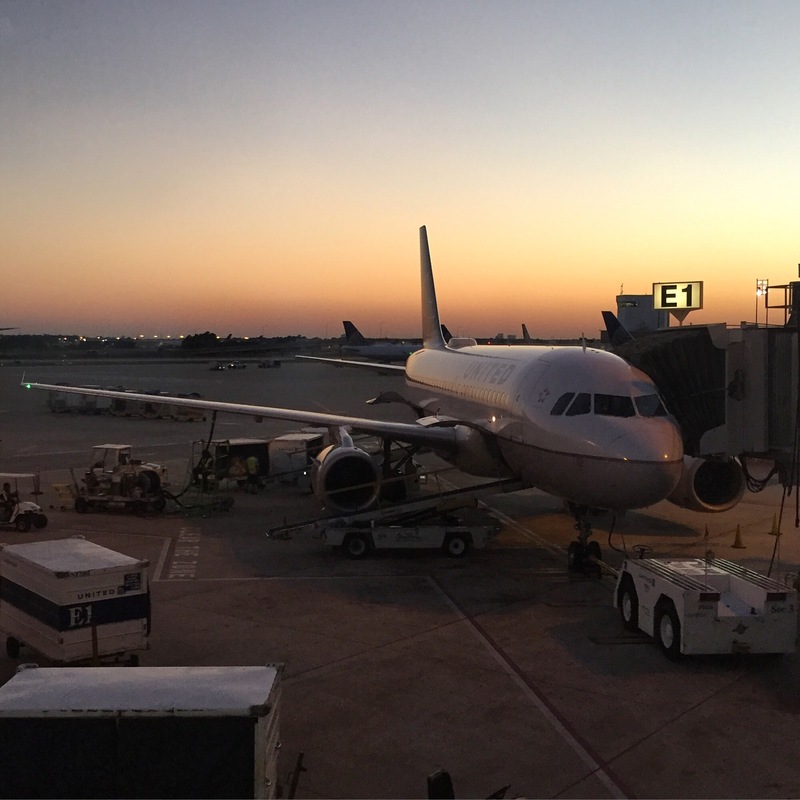 The flight still departs too early for my tastes, but at least you begin the day with a pretty sunrise. 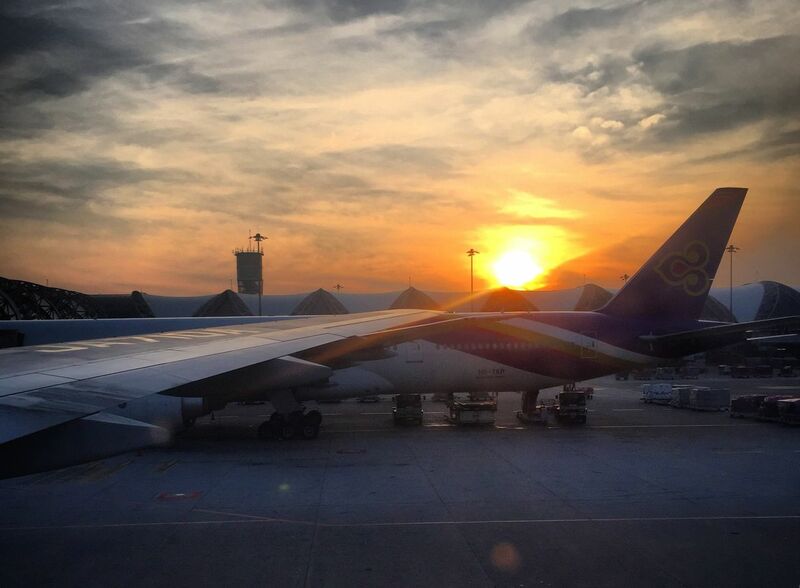 As Tawn explained it, since he used to work for United and the flights out of Bangkok (to Tokyo and Hong Kong at the time) both departed very early, he still associated early flights with the excitement of working. 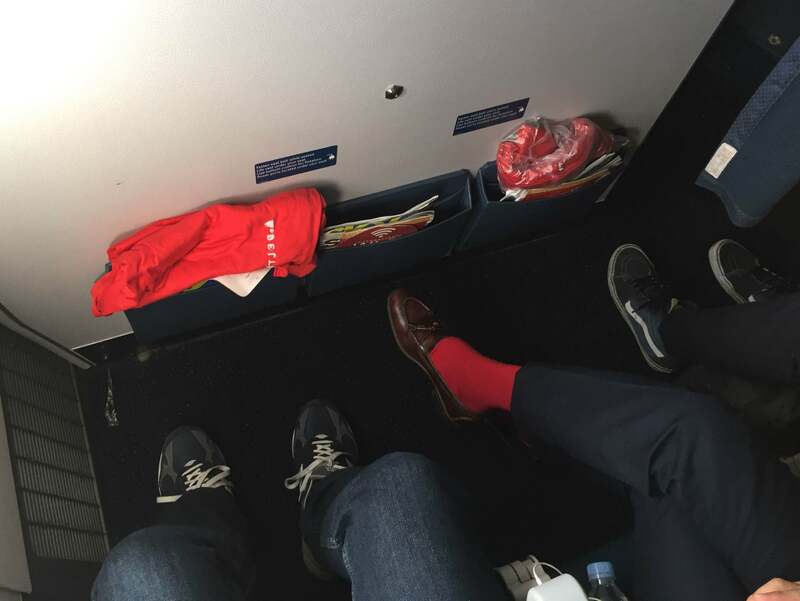 We were assigned a aisle and window seat but another traveler was assigned the middle seat, so we gave him the aisle so Tawn and I could sit together. 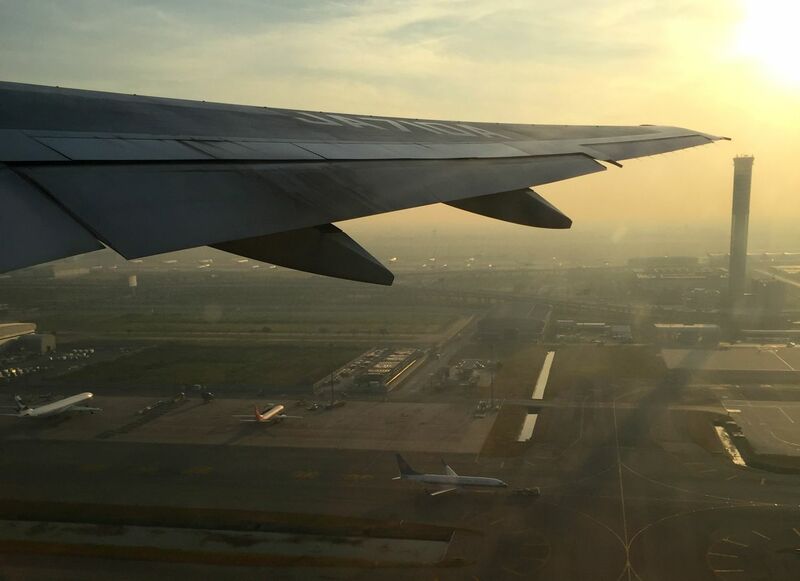 There was a nice view as we climbed into the humid and hazy morning sky above Bangkok. 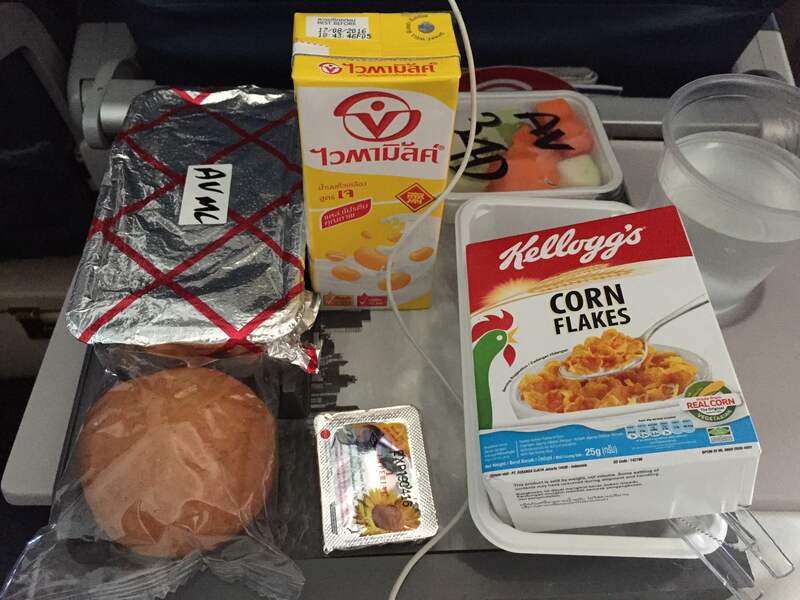 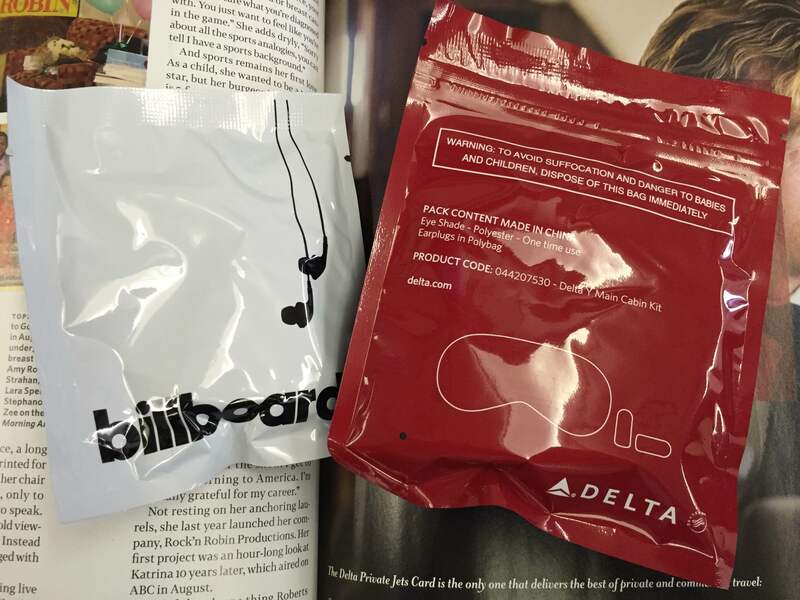 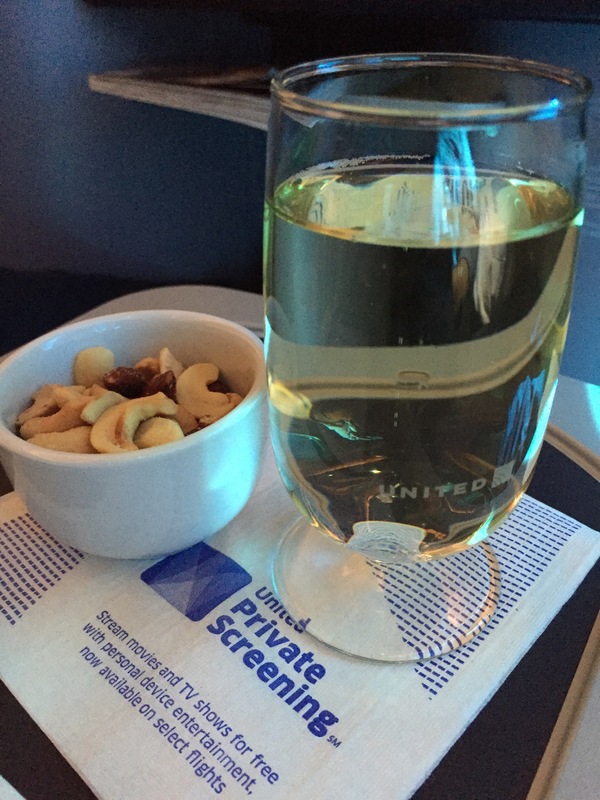 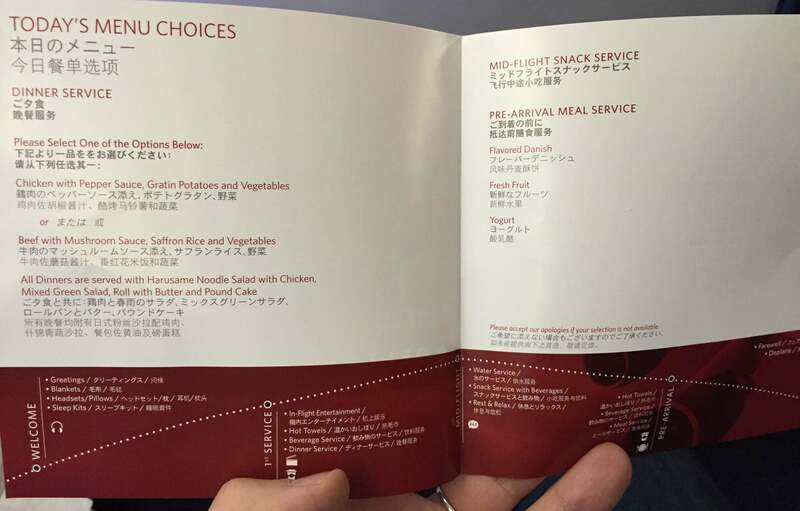 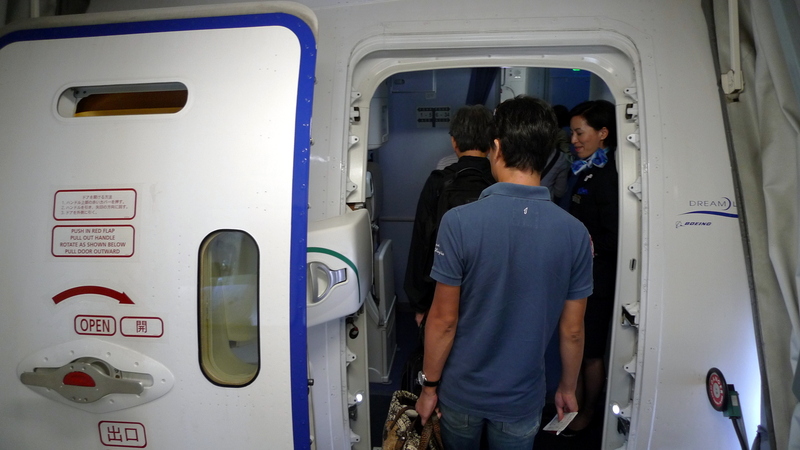 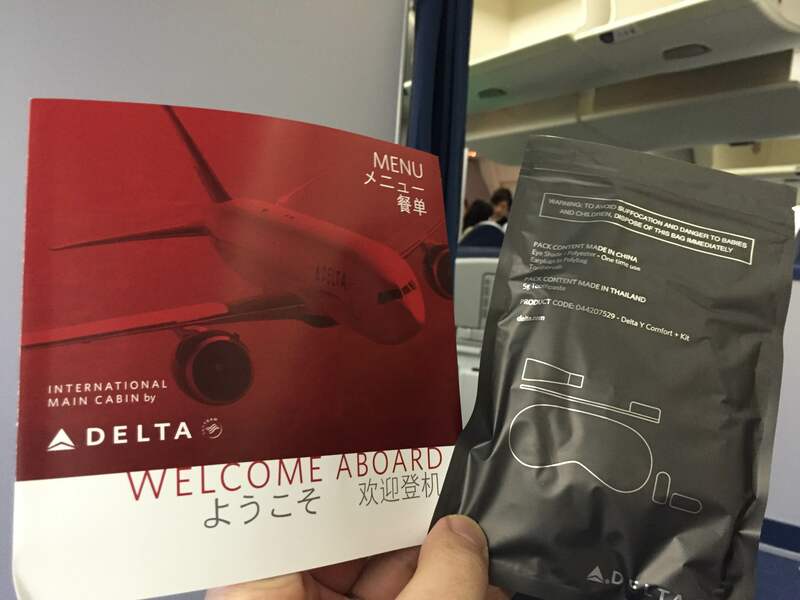 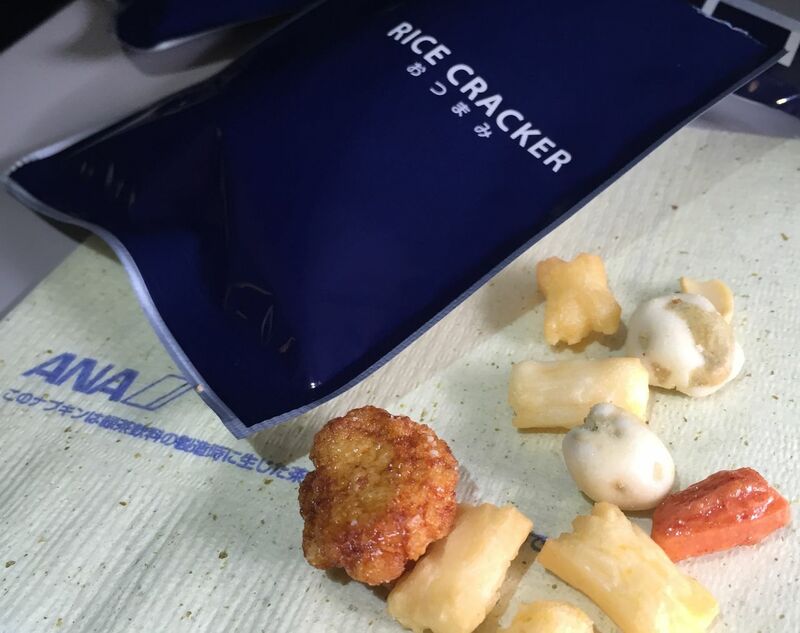 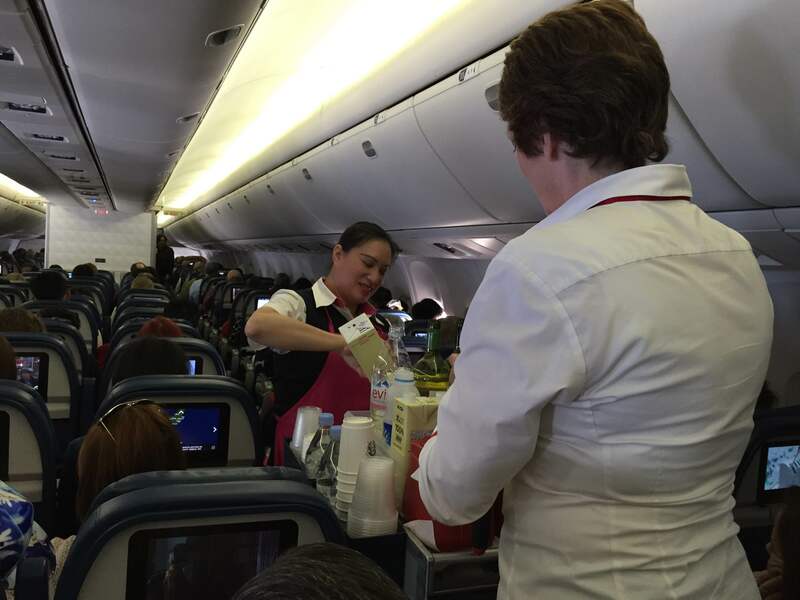 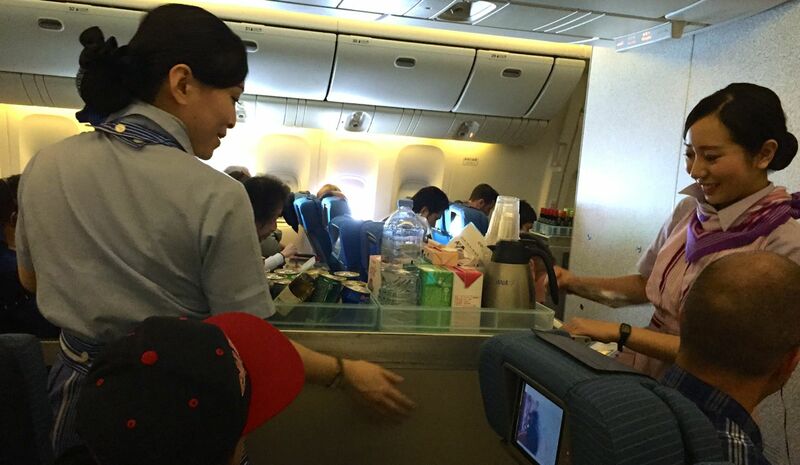 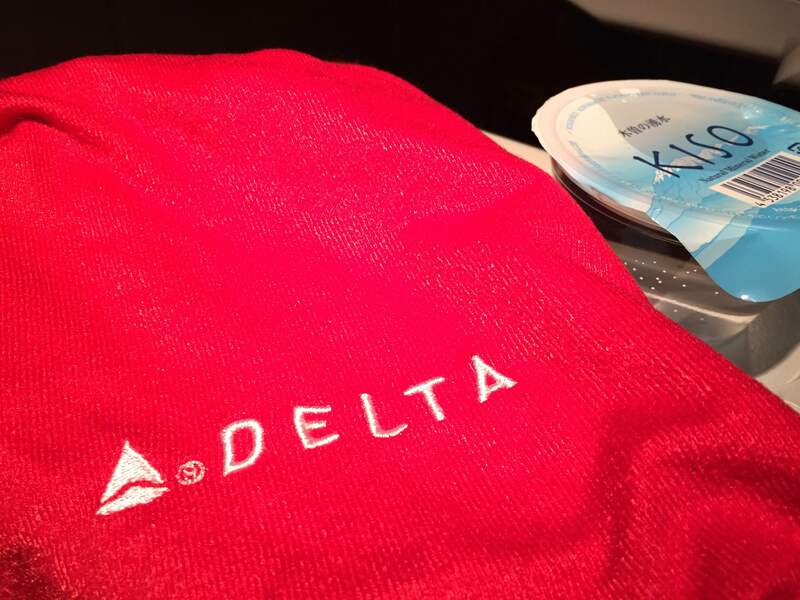 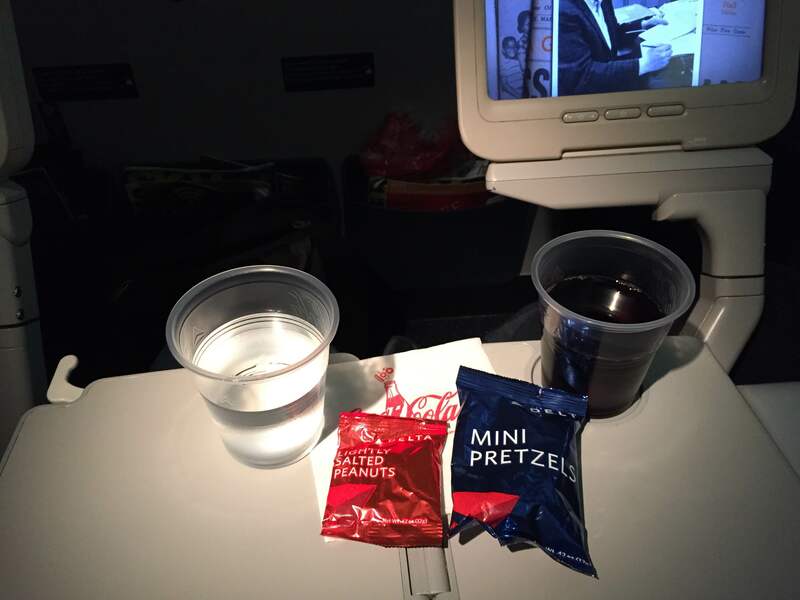 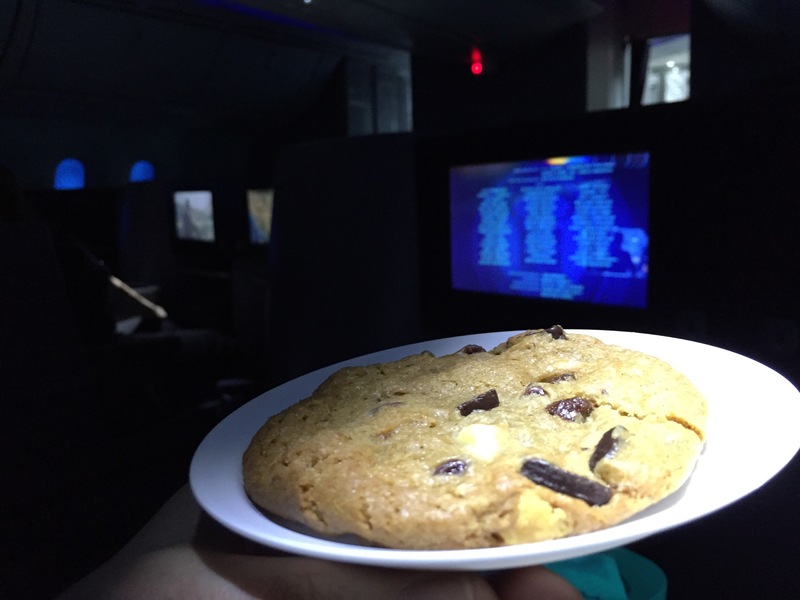 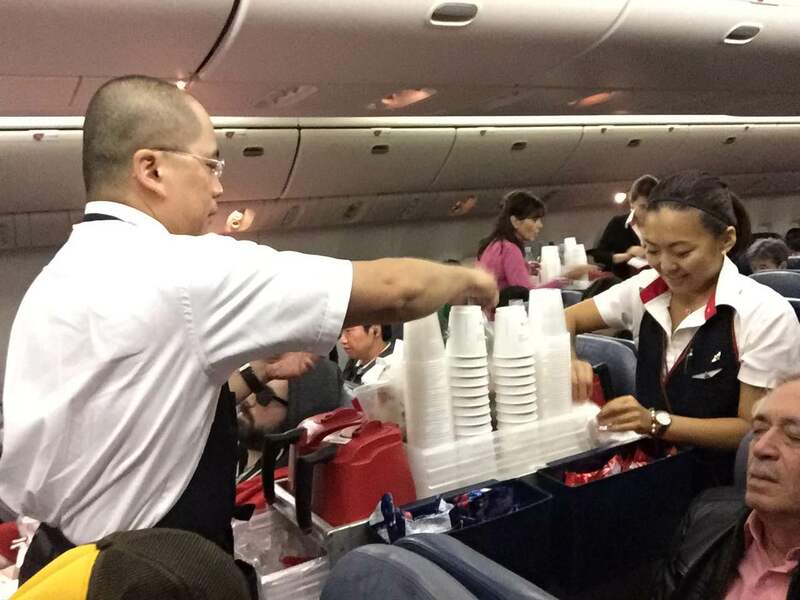 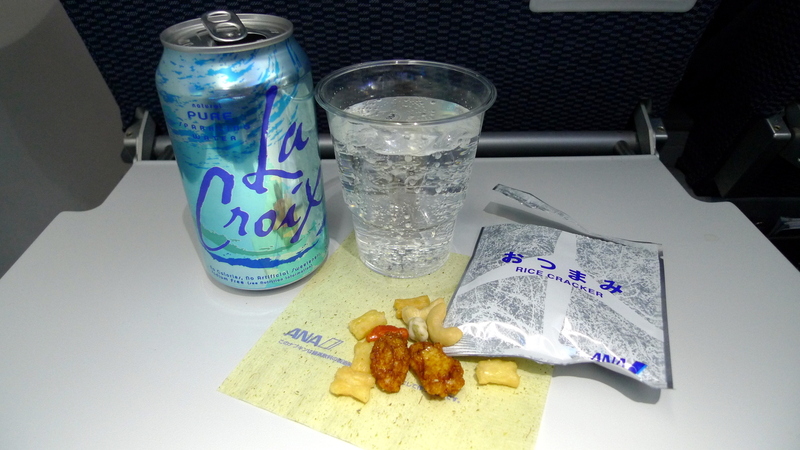 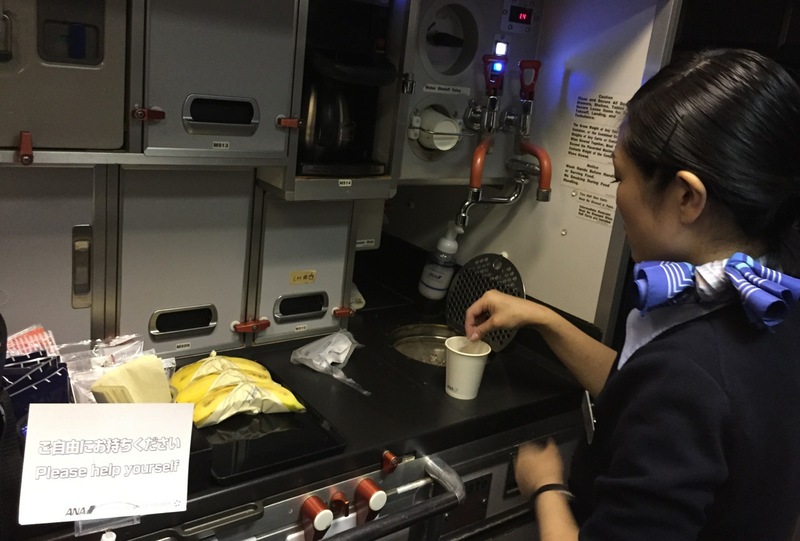 The flight began with a beverage and snack service, a selection of tasty rice crackers. 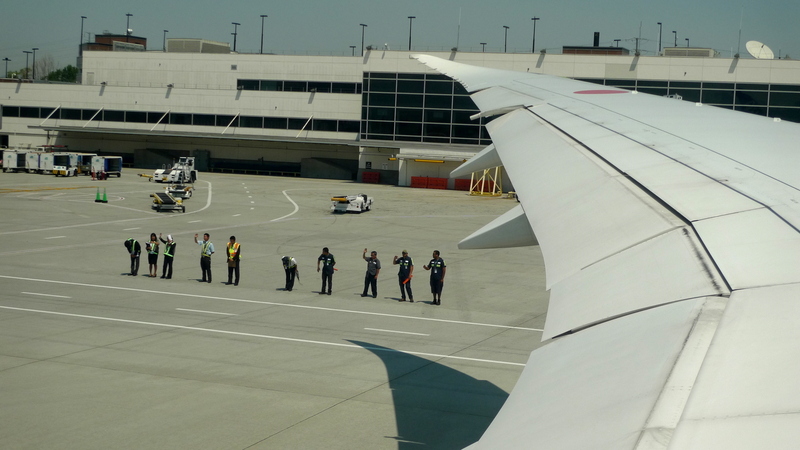 The flight attendants at ANA are very friendly. 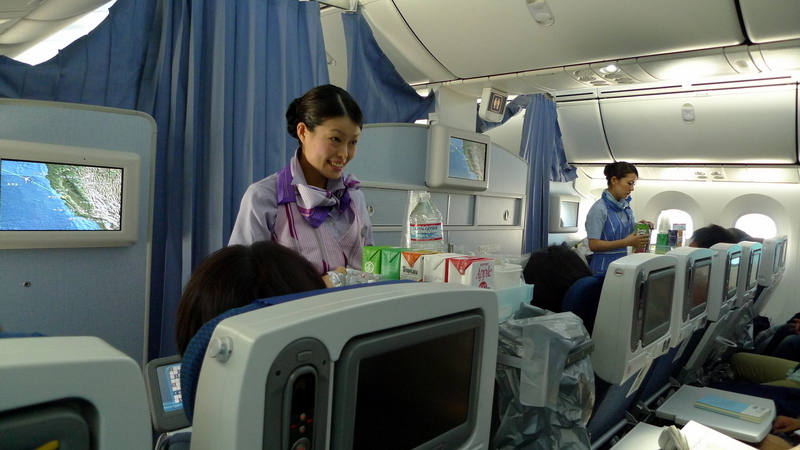 Sometimes their English isn’t perfect, but they are very sincere and quick to respond to requests. 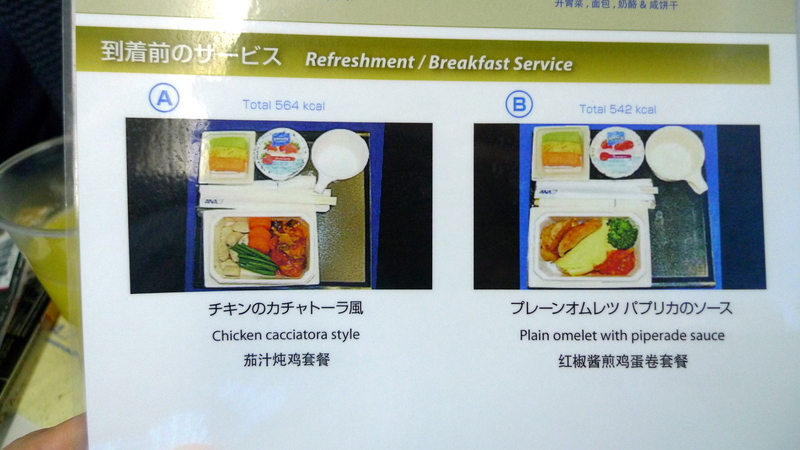 I opted for a western-style breakfast, which if I recall was chicken croquettes served with mashed potatoes. 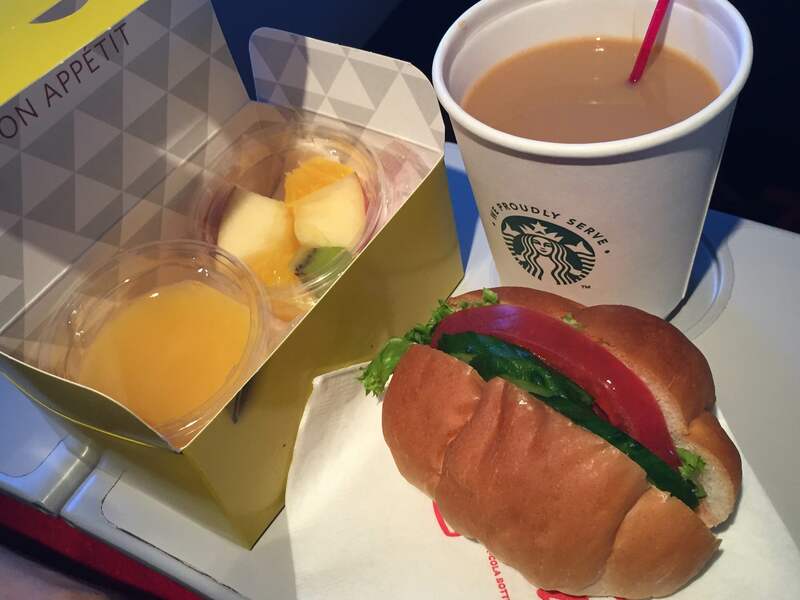 When I say “breakfast”, I mean “meal”. 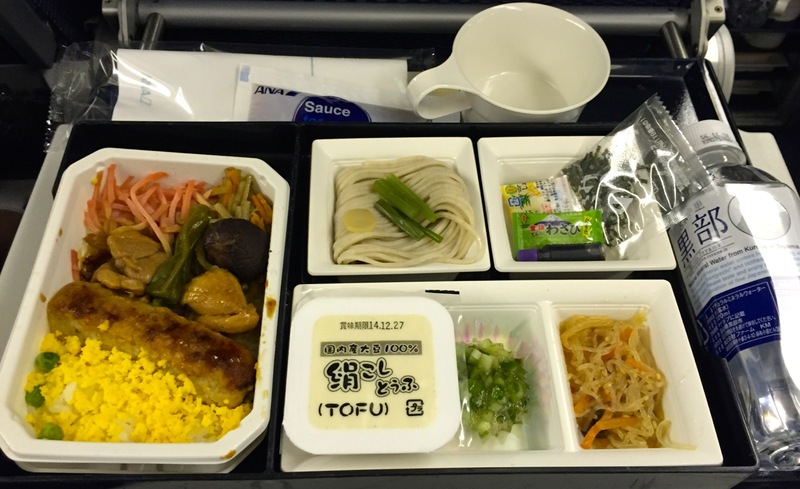 Tawn chose the Japanese style meal, which was a piece of mackerel served with a variety of pickles and other sides. 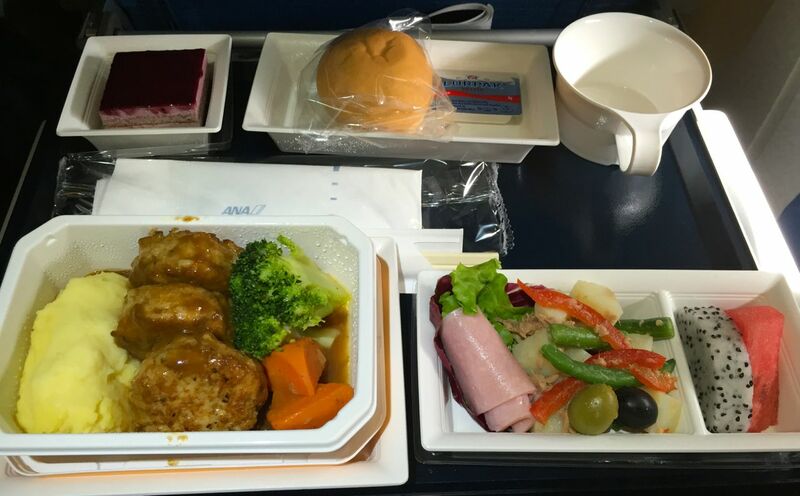 Both meals were tasty and satisfying. 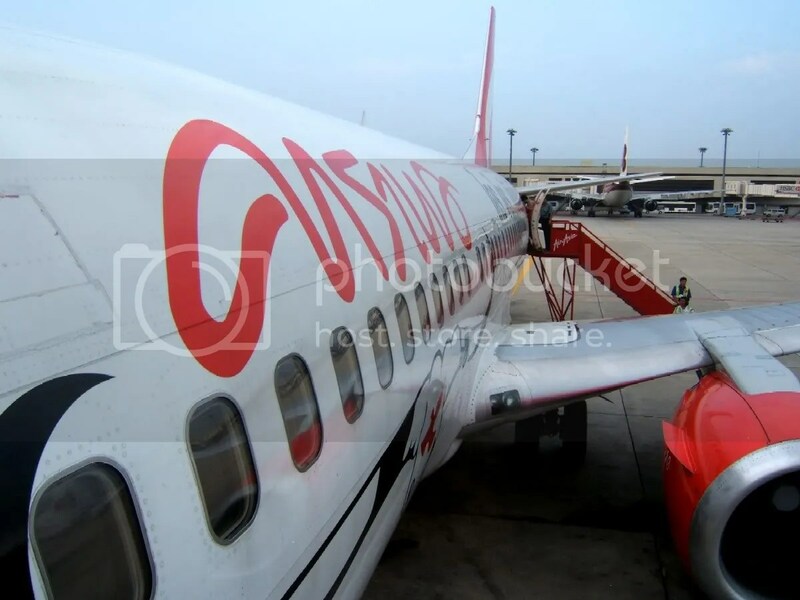 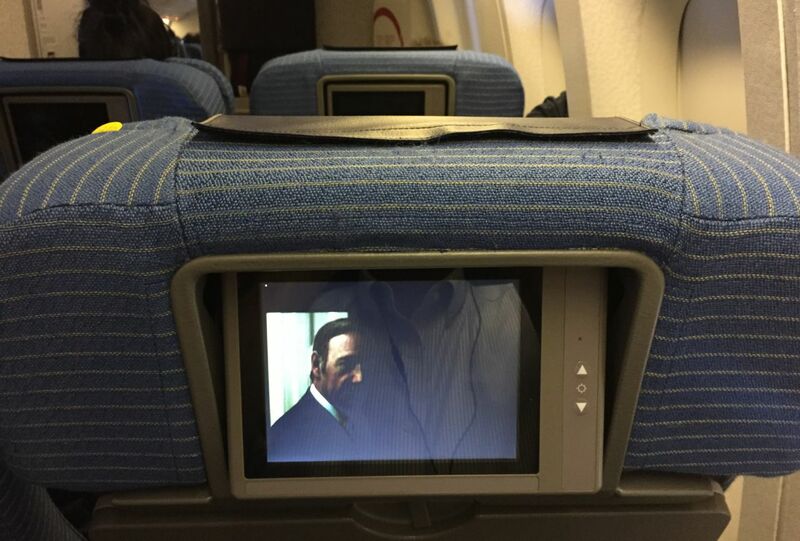 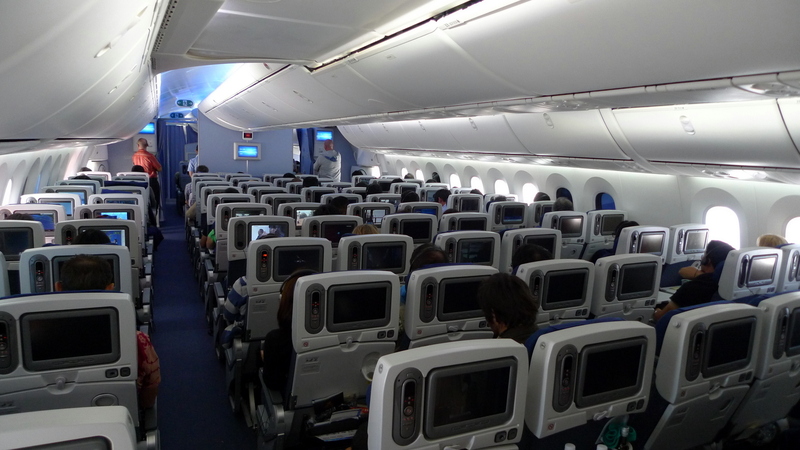 The planes used intra-Asia have an older interior, with narrower leg room and smaller, more difficult to view monitors. 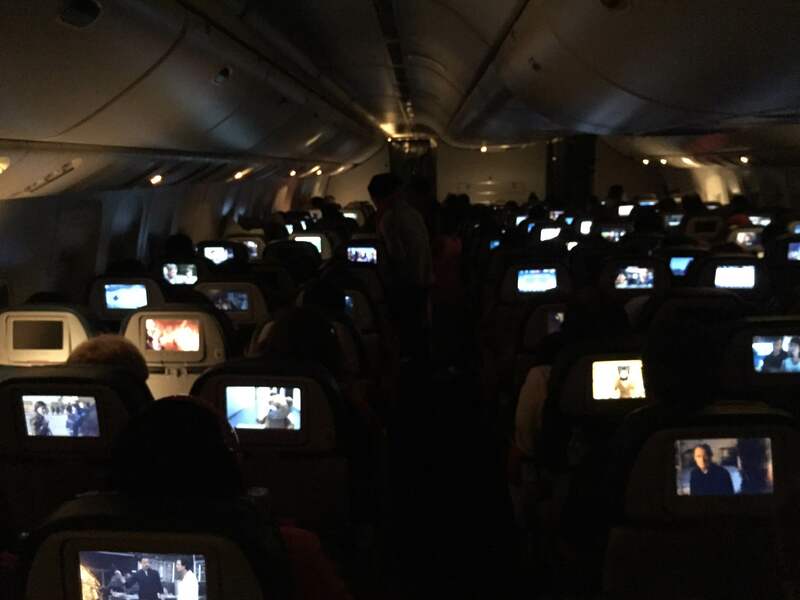 The entertainment system still offers dozens of movies and a hundred or more TV shows, all on-demand. 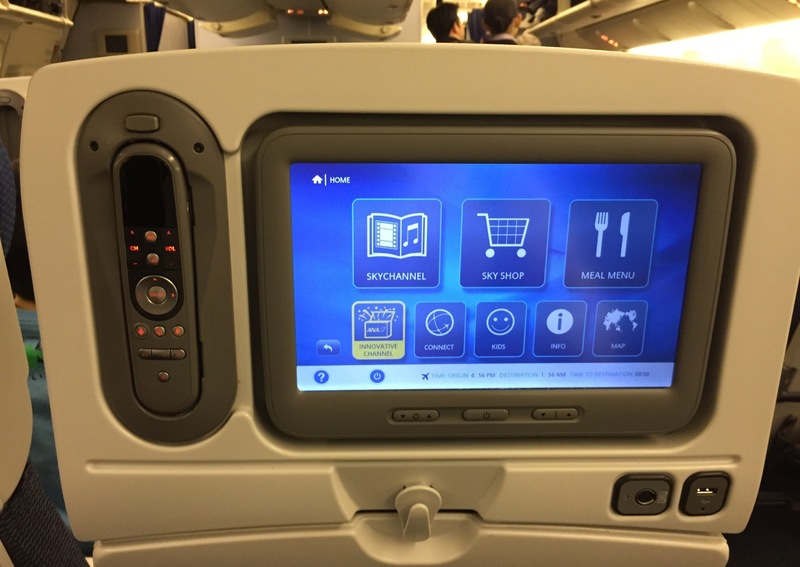 However, the screens are not touchscreen and you have to use the remote controller. 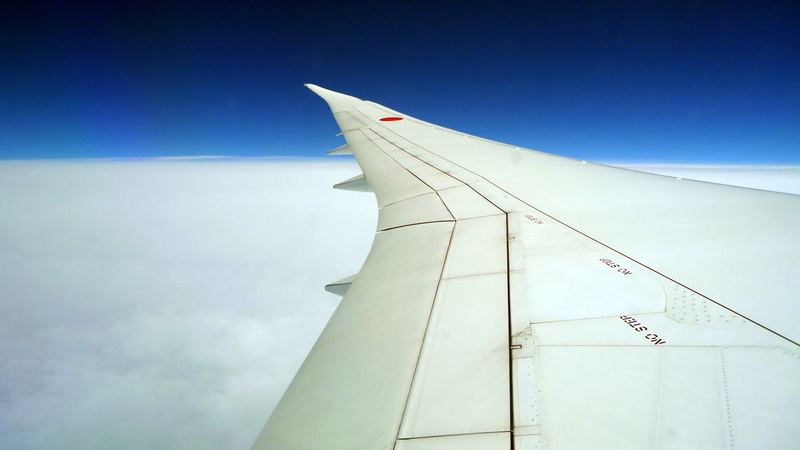 The flight to Tokyo took about six hours and we arrived on a sunny and clear afternoon. 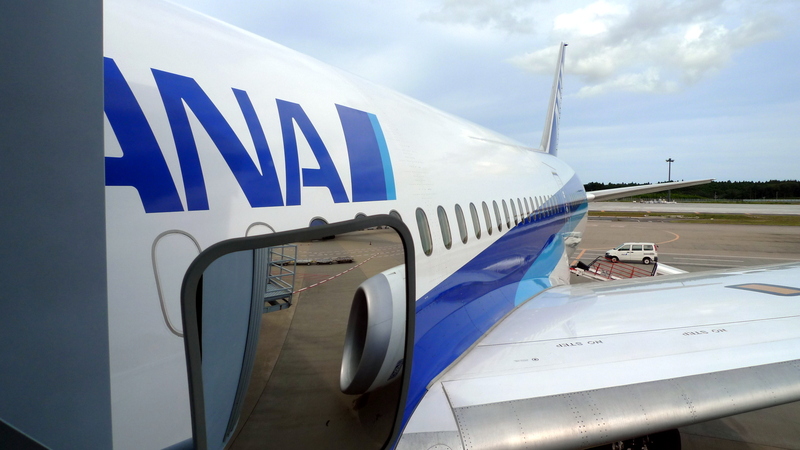 A nice view of an ANA Boeing 767 with the new drag-reducing wingtips. 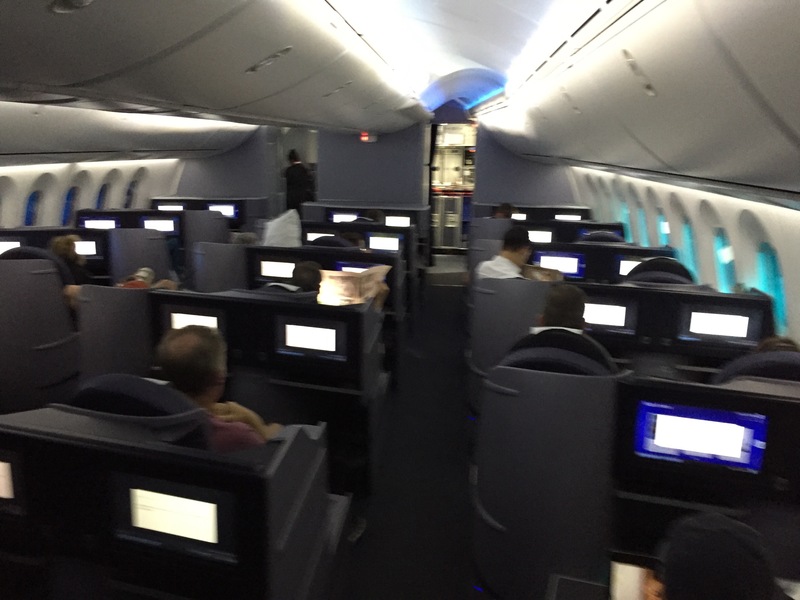 The 767 remains one of my favorite planes, mostly due to the 2-3-2 layout in economy class, where everyone is either on an aisle or no more than one seat away from an aisle. 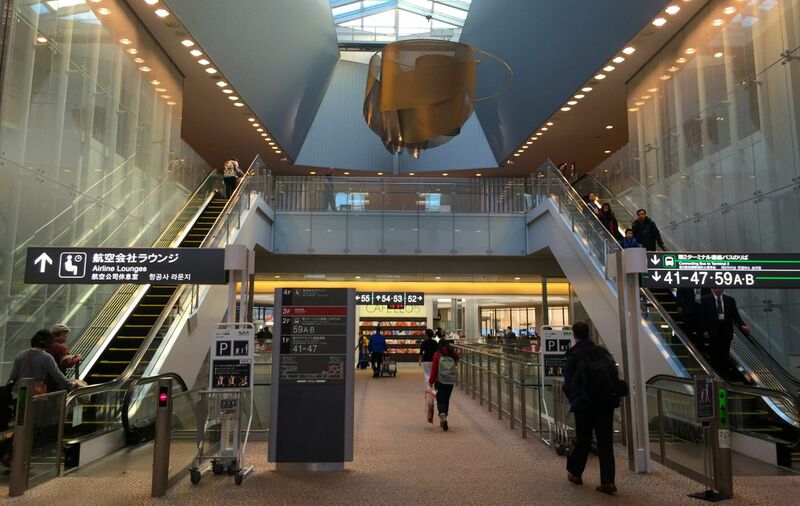 Narita is an efficient, modern airport through which to connect. 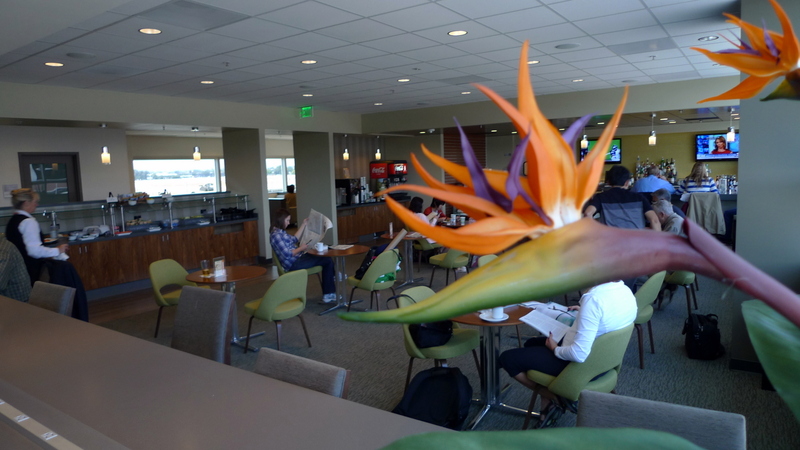 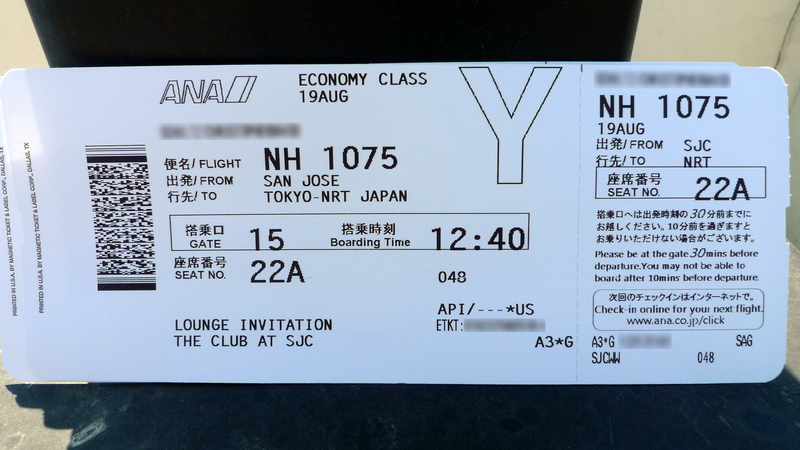 We spent some time at the All-Nippon Lounge, which has a good selection of food and beverage, shower facilities, and a nap area. 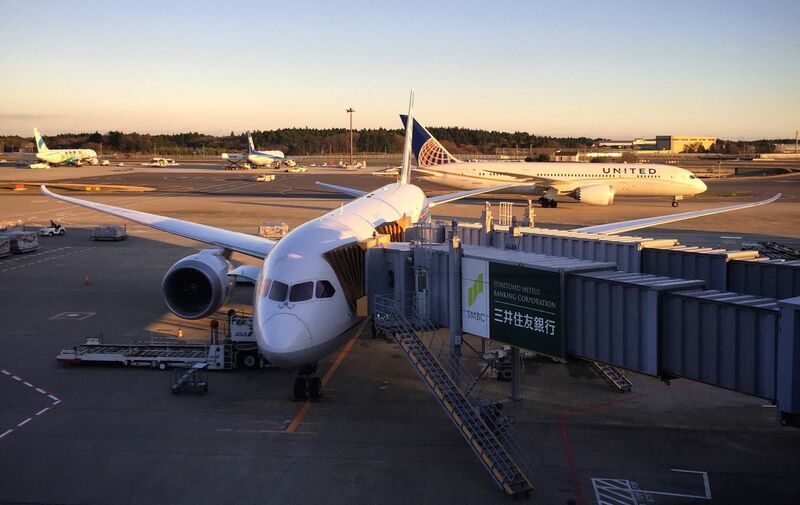 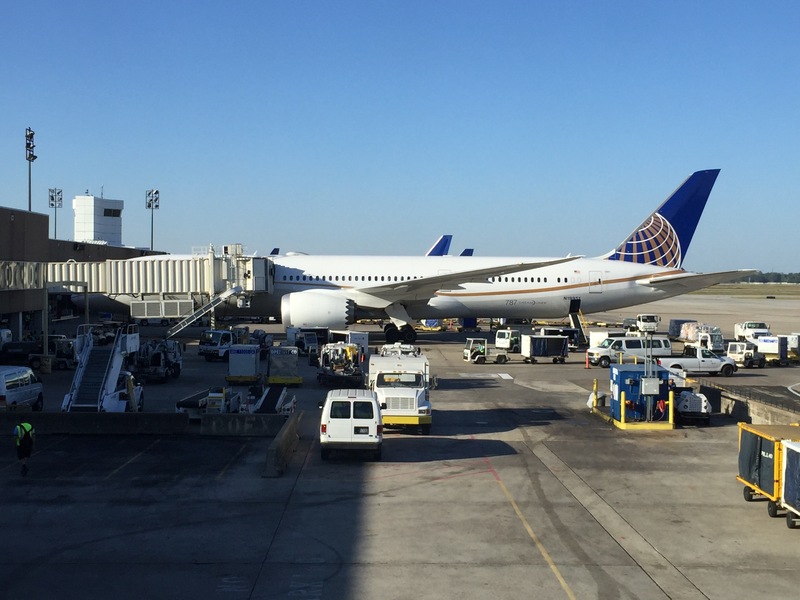 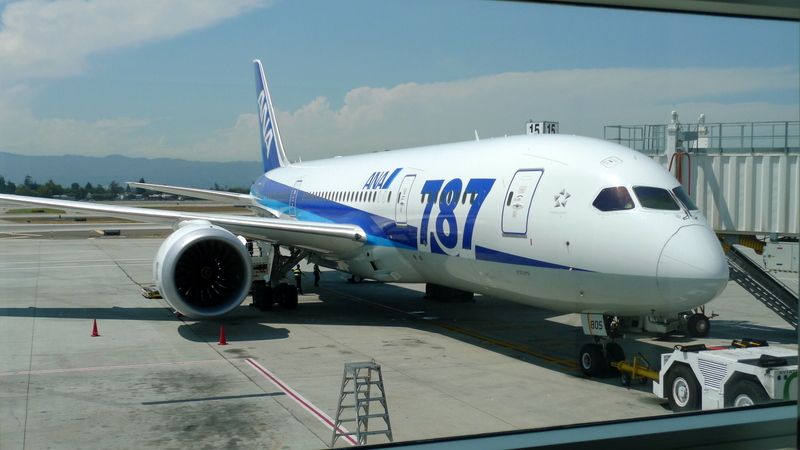 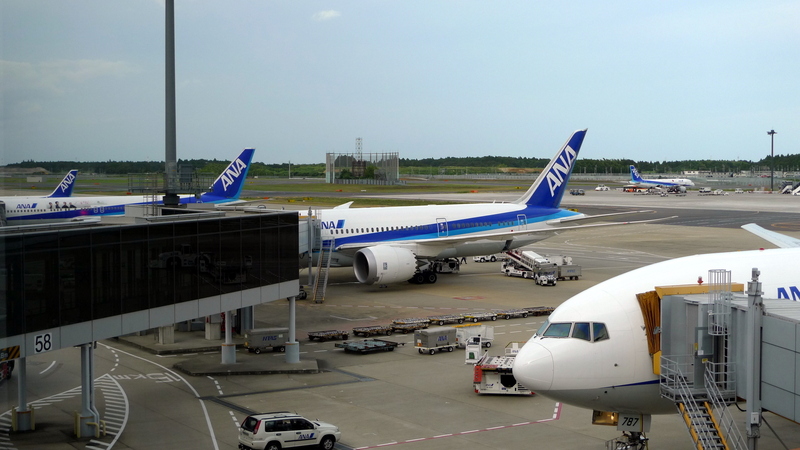 A meeting of Boeing 787 Dreamliners, the one in the foreground flown by All-Nippon and the one in the background flown by United Airlines. 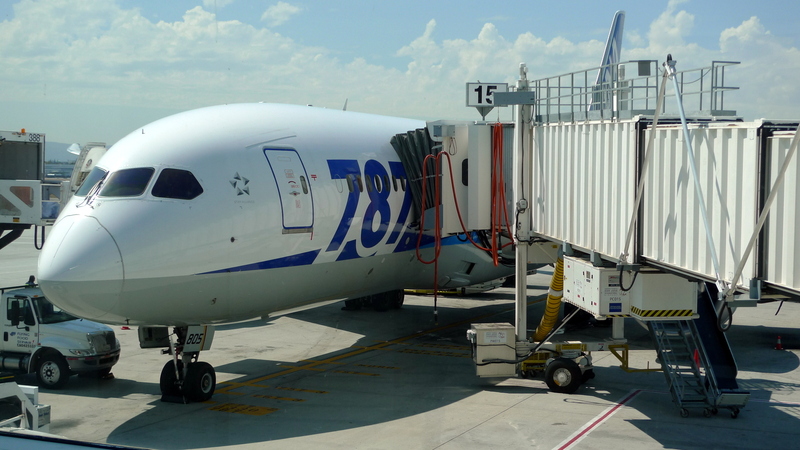 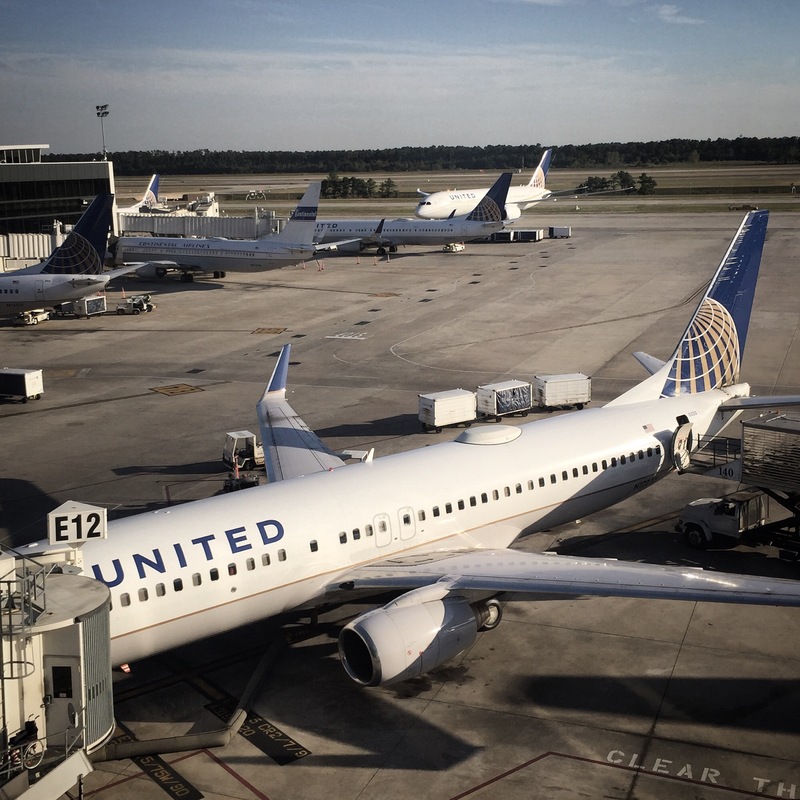 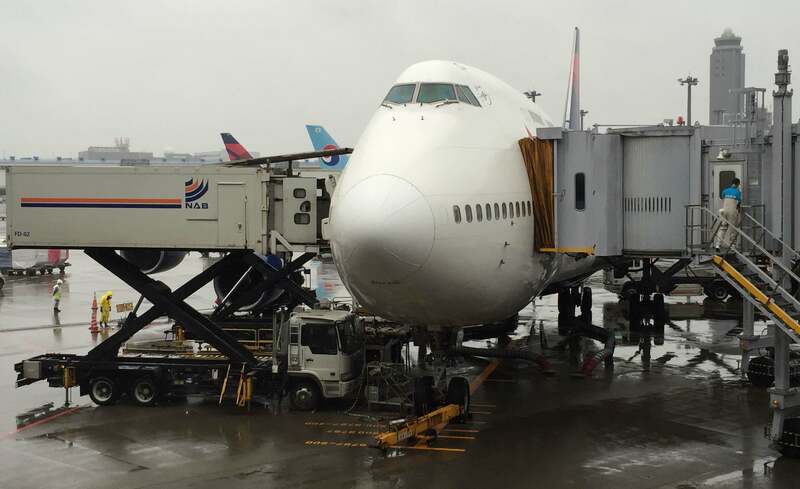 The two airlines have an immunized joint venture for trans-Pacific and connecting flights, meaning that they operate these flights as if they were a single carrier, sharing revenues and expenses. 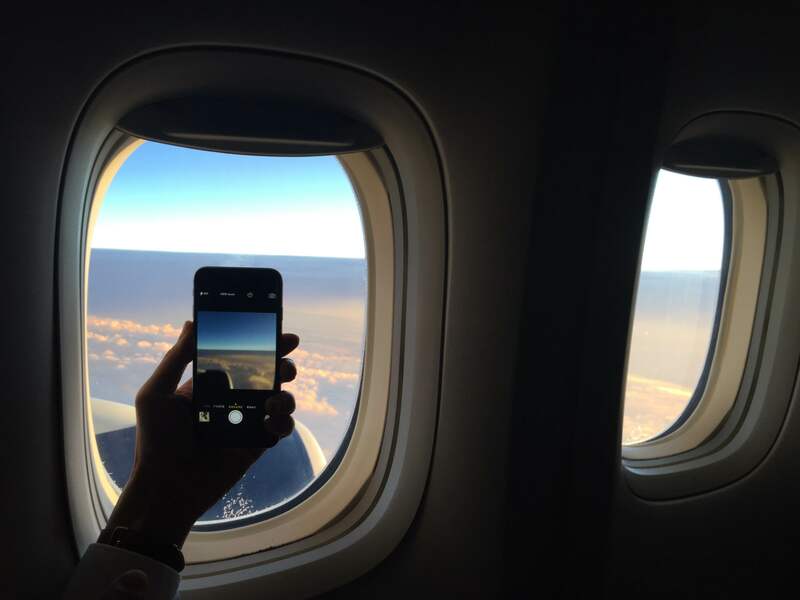 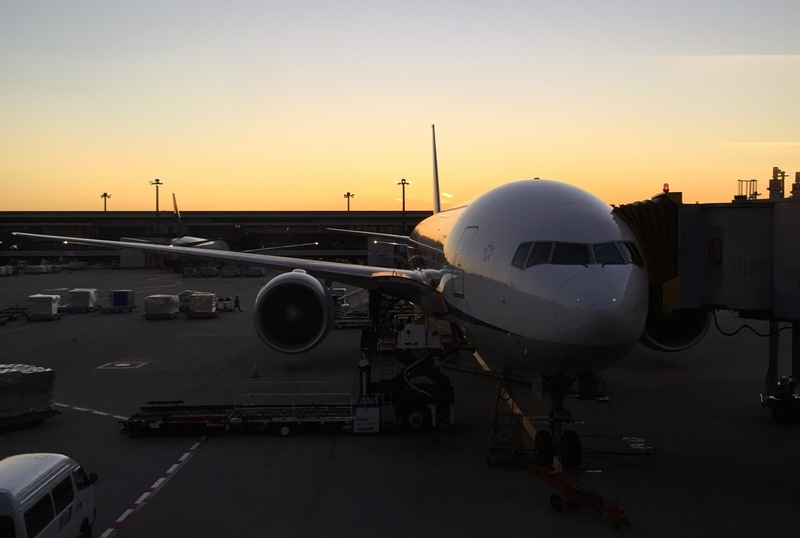 The sun had already set when we boarded our Boeing 777-300 ER bound for Chicago O’Hare International Airport. 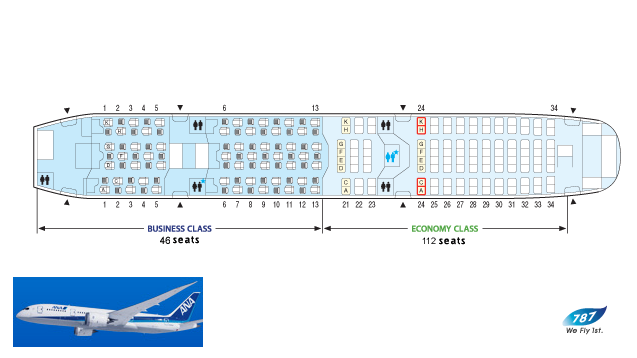 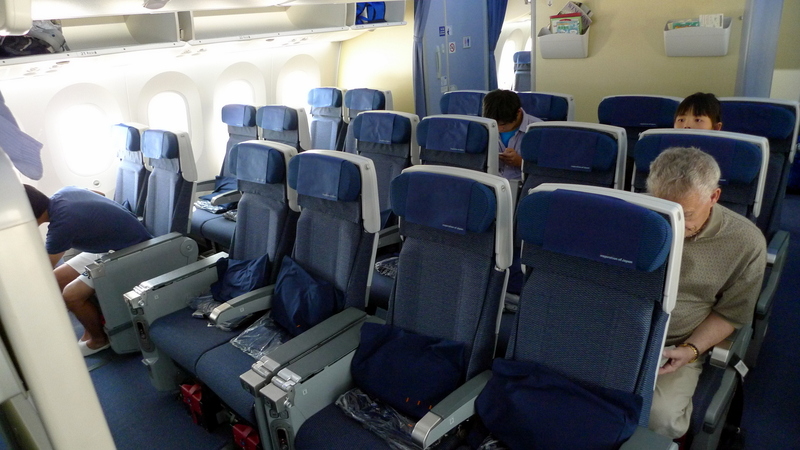 All-Nippon is one of the few carriers to do a 2-4-3 layout in economy class, which provides a range of options for different size groups traveling together. 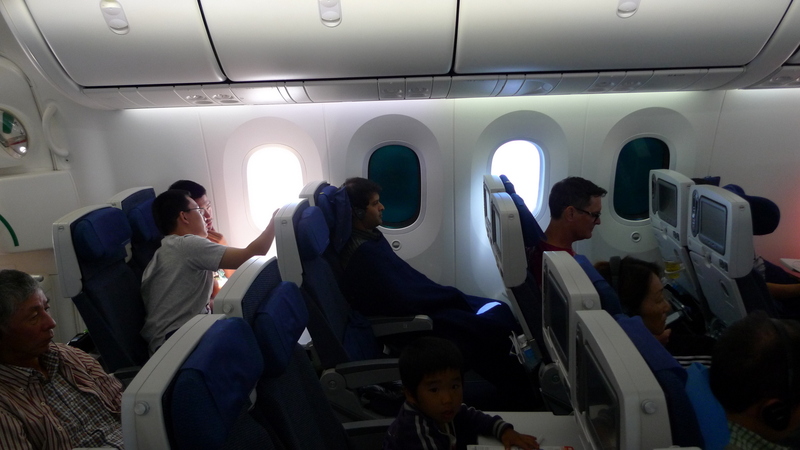 Unfortunately, we ended up with two of the seats in the middle four. 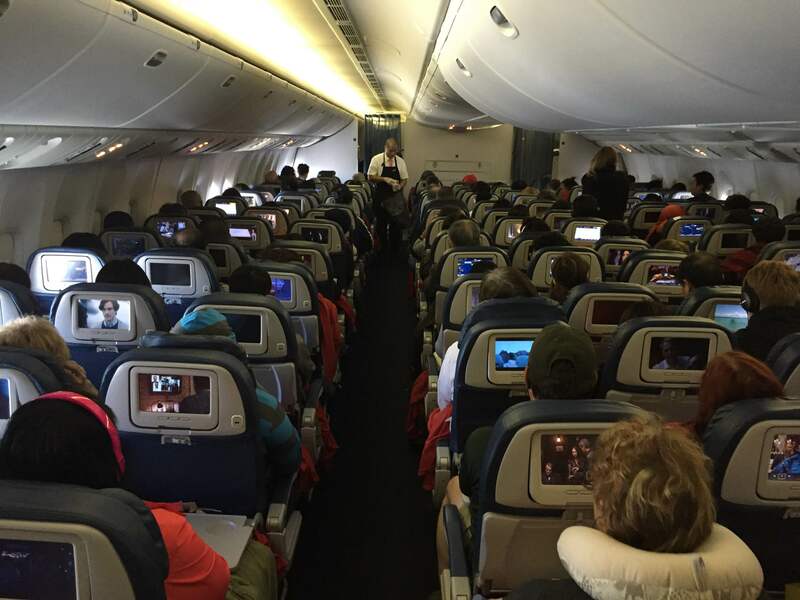 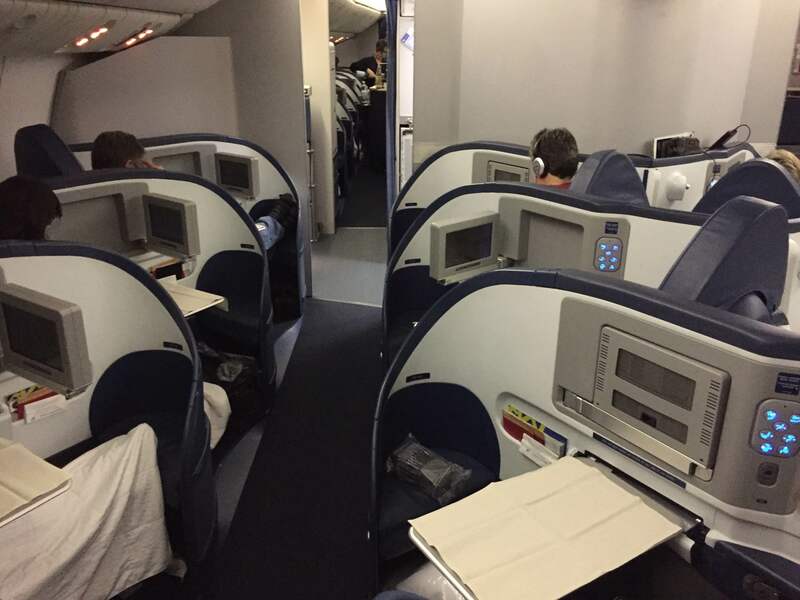 However, the good thing is that these are actually two pairs of seats, so the people in the middle each have their own armrest and about two inches between them. 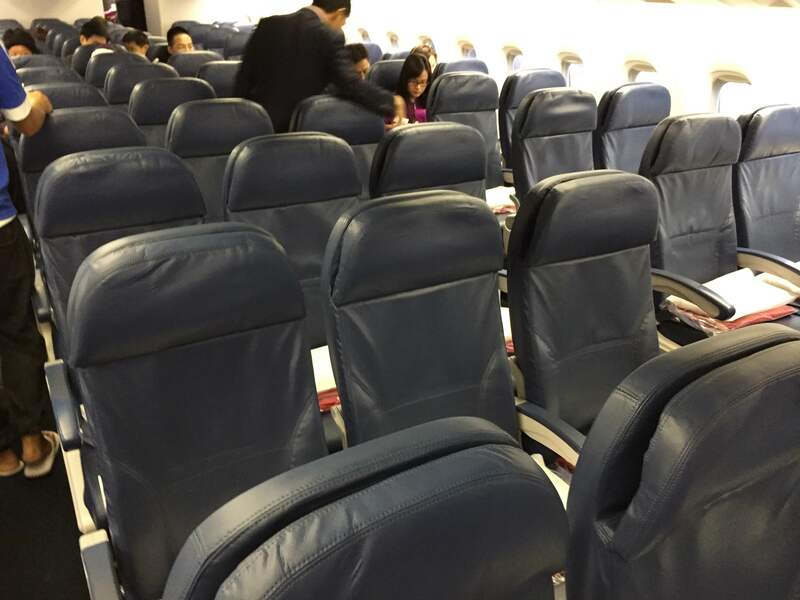 That means the seats do not feel cramped. 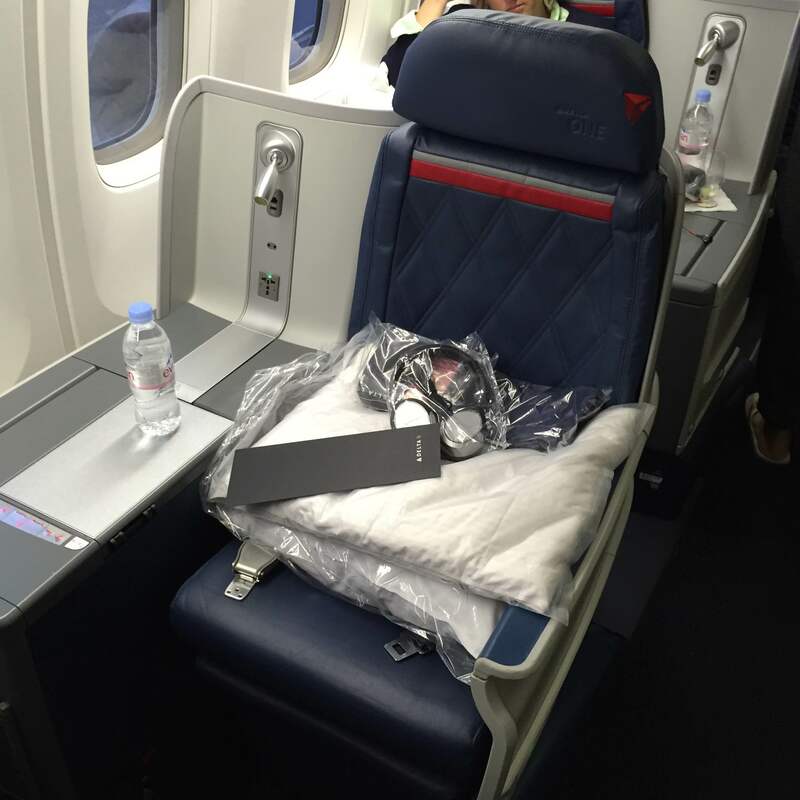 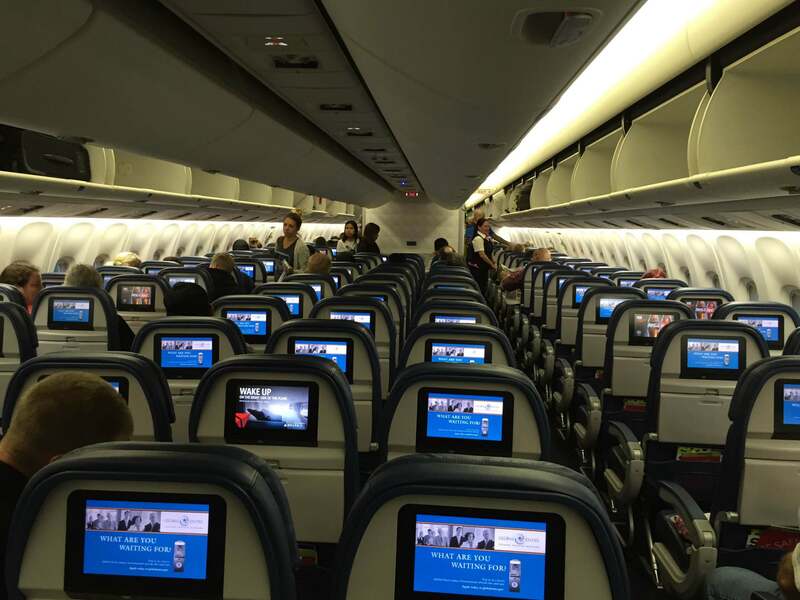 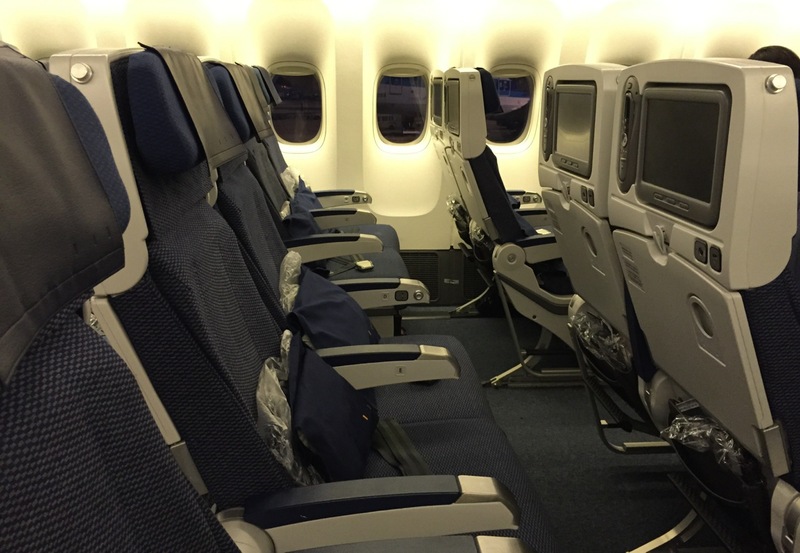 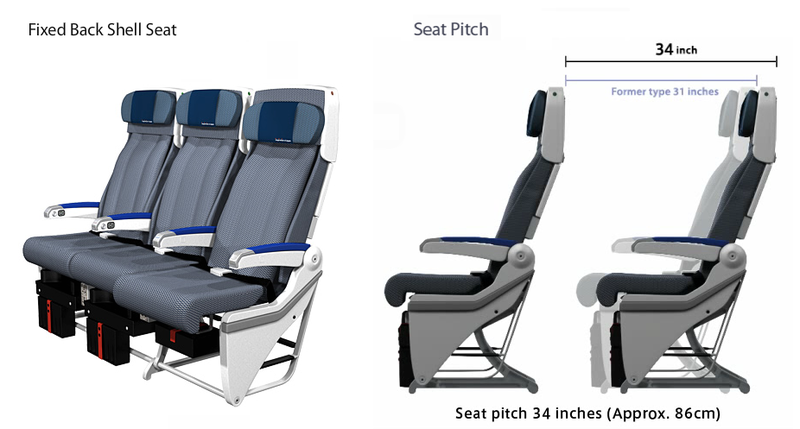 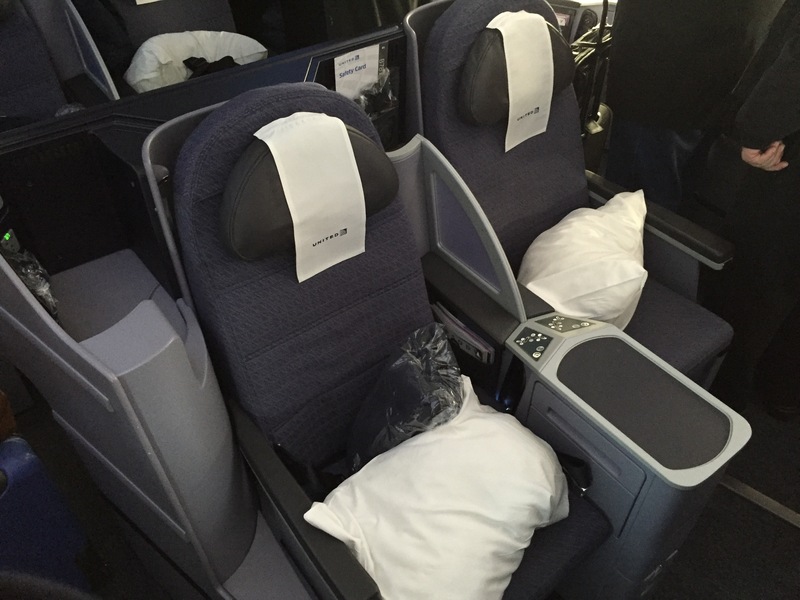 Also, All-Nippon offers 34″ of pitch (the distance between a point on one seat and the same point on the seat in the next row) – this is 3″ more than most US carriers offer. 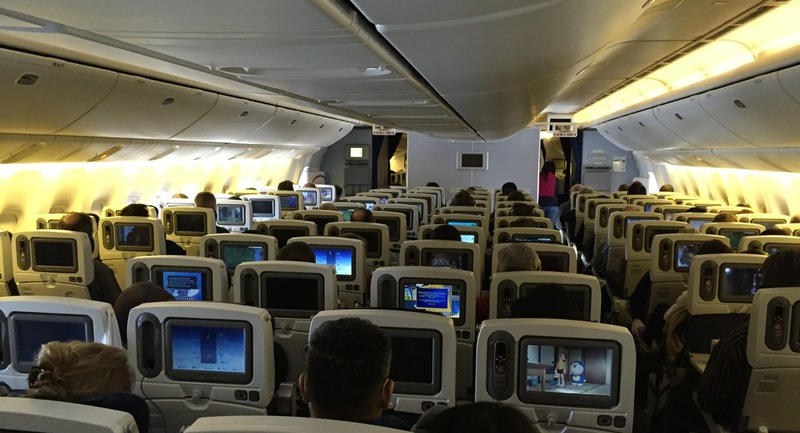 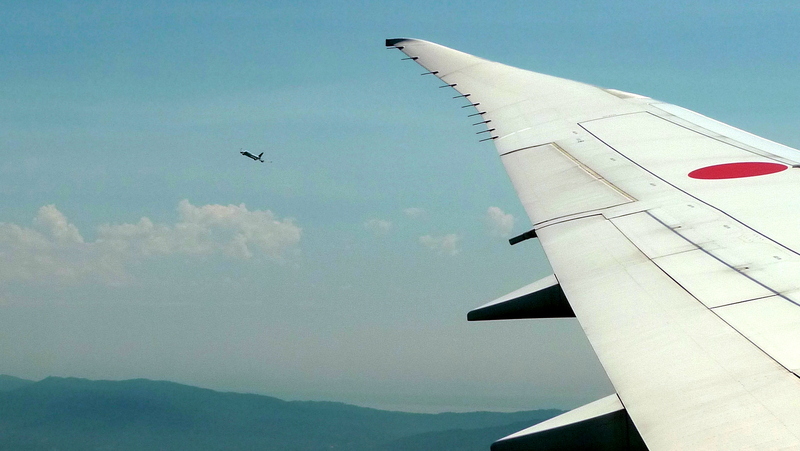 On top of it, these planes us a “shell back” seat that never reclines into your space. 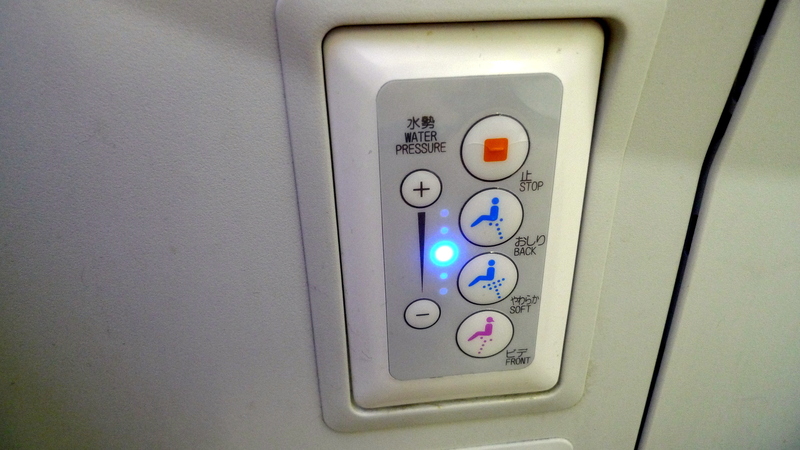 Instead, as you recline your seat, your seat bottom slides forward, reducing your own leg room. 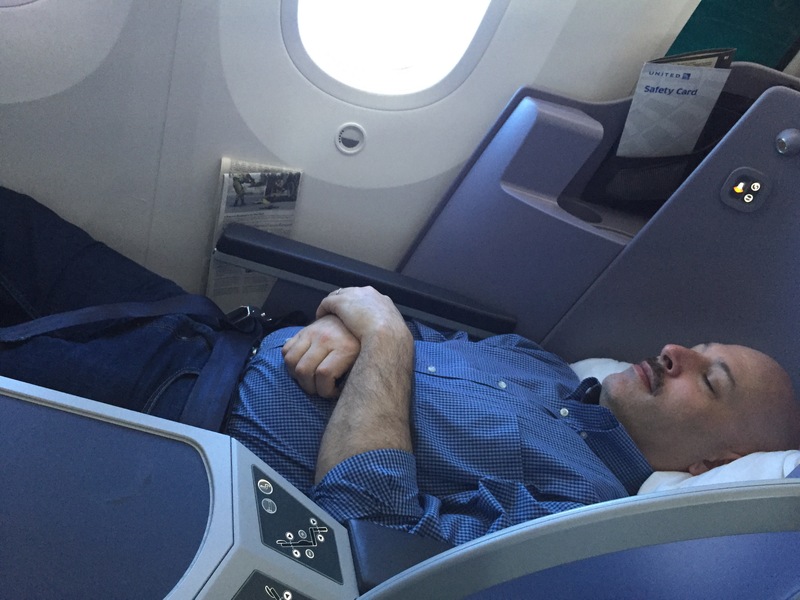 I prefer this because I rarely sleep on planes, but dislike having someone recline into my space. 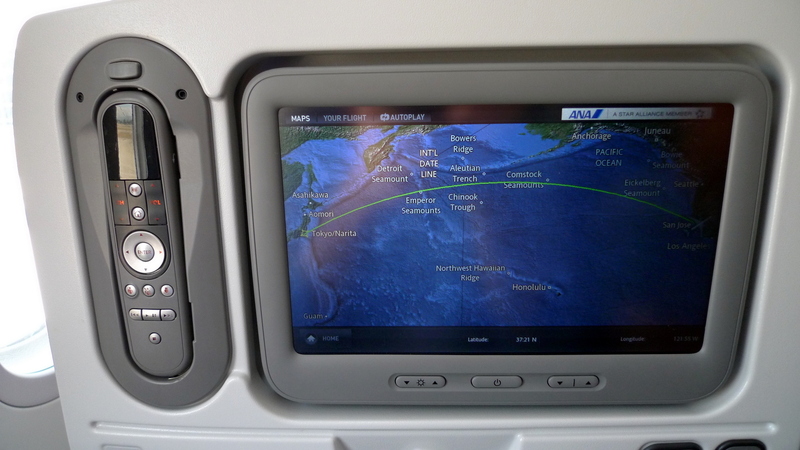 As you can see, the monitors are much larger and brighter, and they feature touch-screen technology. 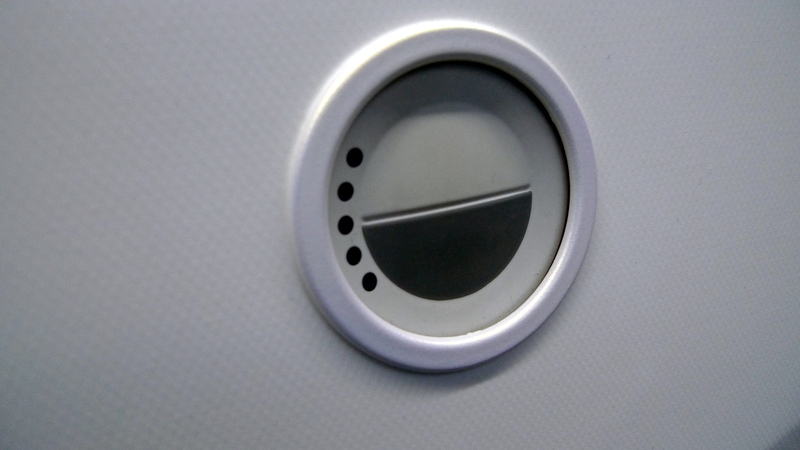 There is also a USB port in case you want to charge your electronic devices. 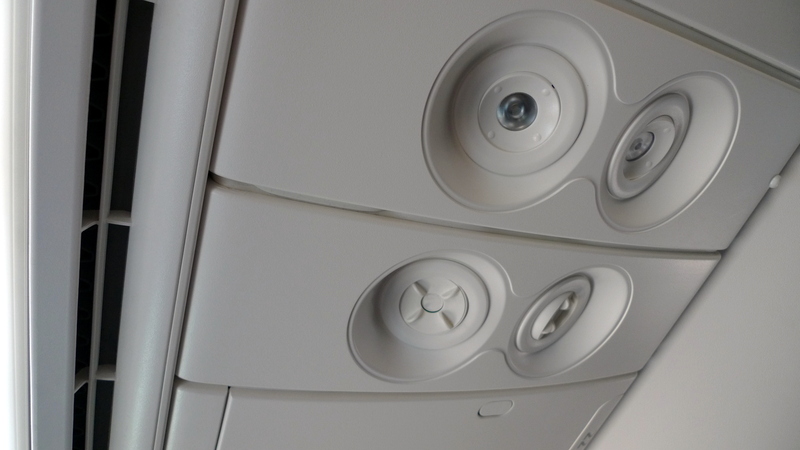 There is also a standard power outlet in between the seats. 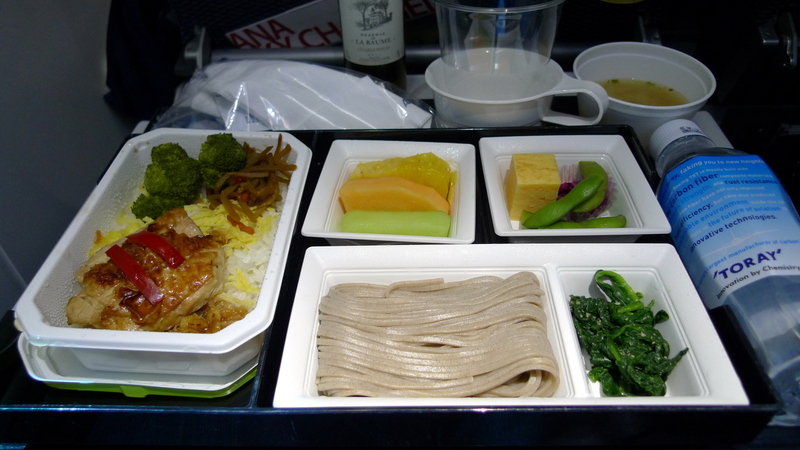 Tawn and I both chose the same meal, a Japanese style grilled pork dish with cold soba noodles, tofu, and rice. 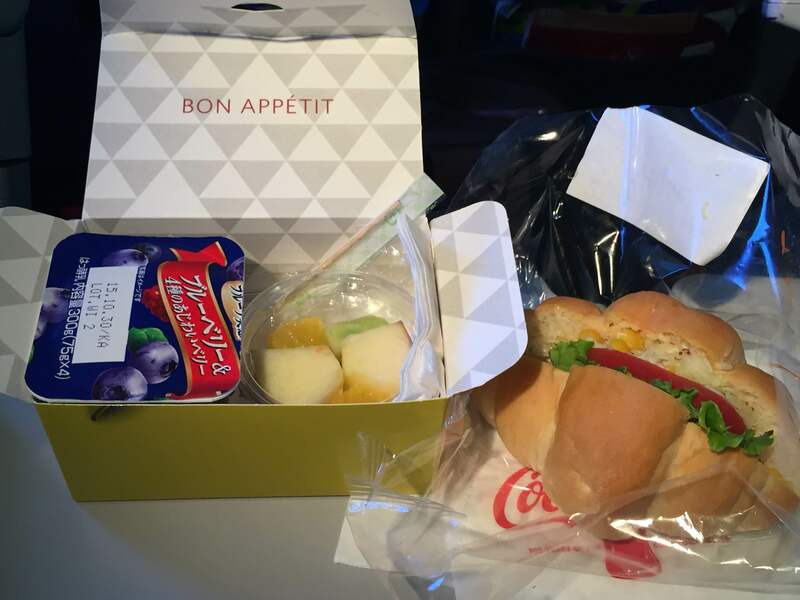 Very tasty. 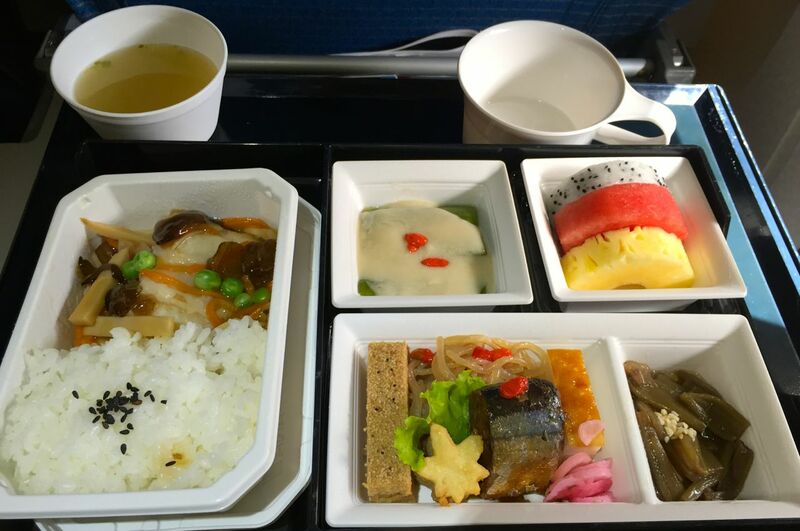 One of the things I like about Japanese meals is that they are served with many small side dishes. 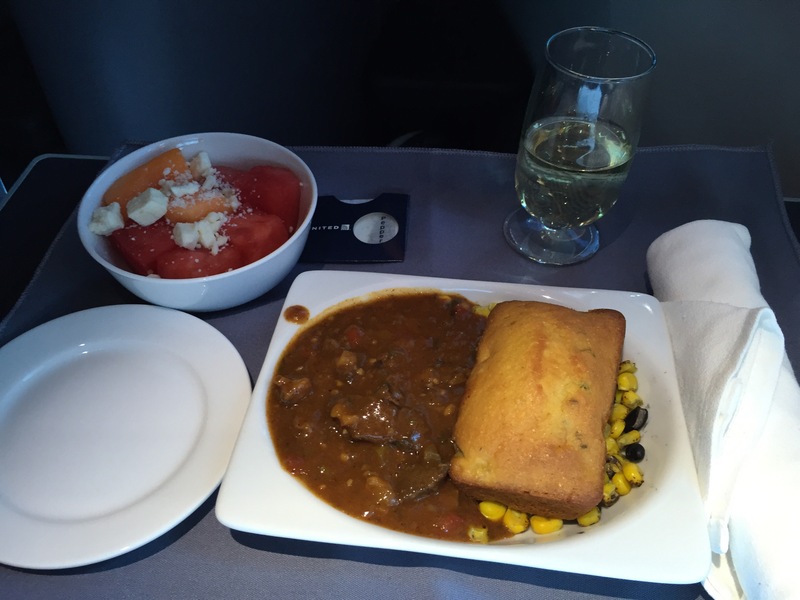 The variety of tastes and textures makes the meal very fulfilling. 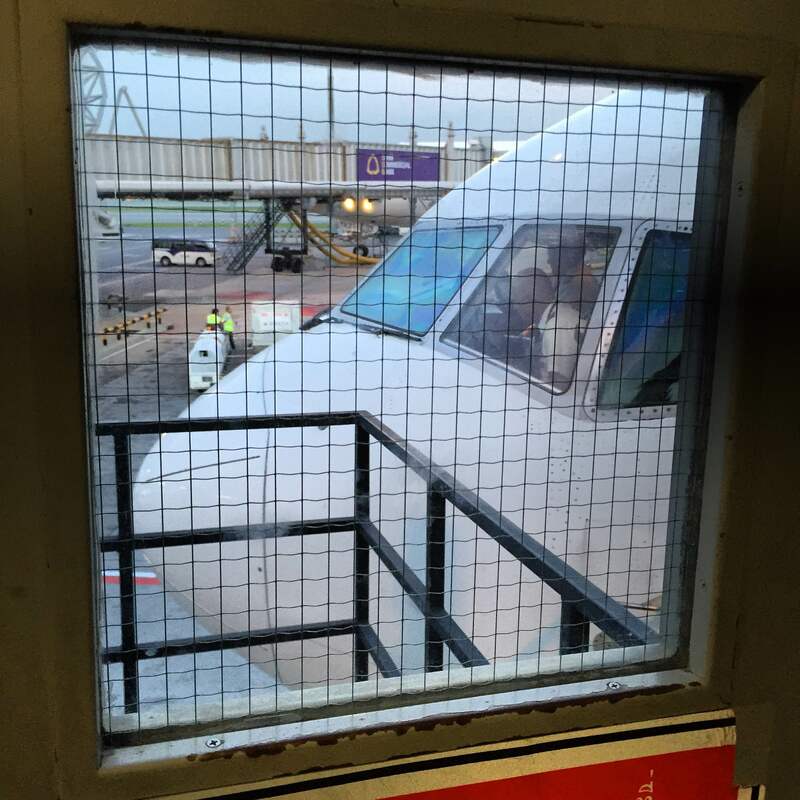 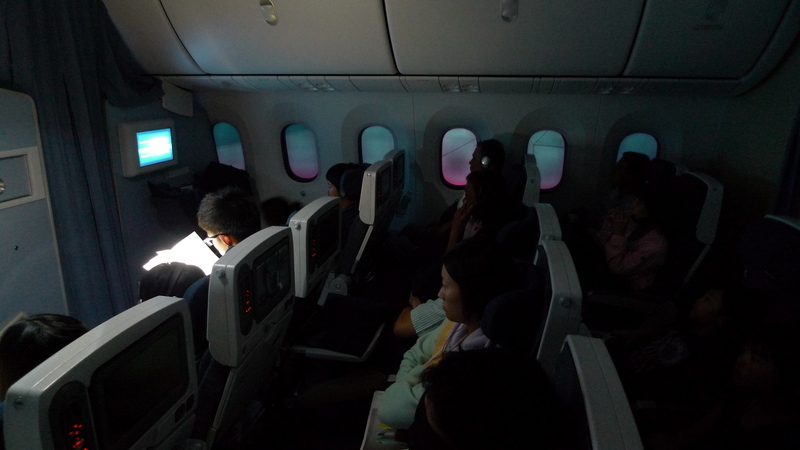 After dinner, the crew dimmed the cabin lights and everyone was asked to close their window shades. 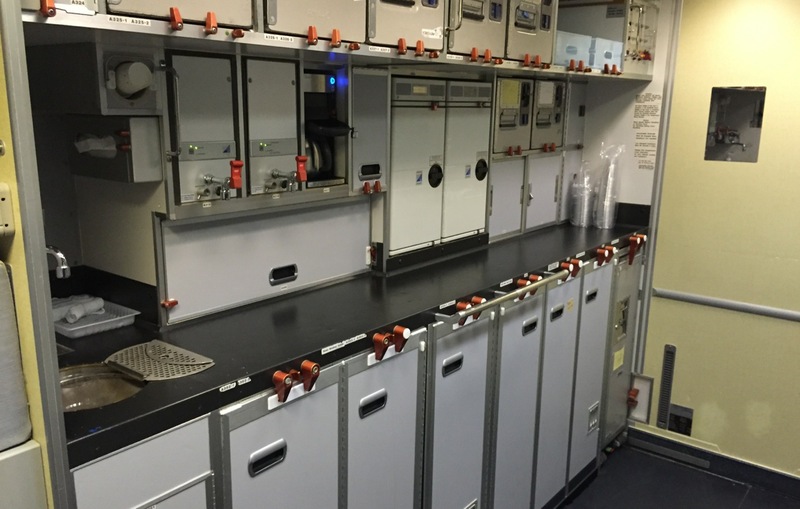 A view of the rear galley, where there was a bit of space that you could stand and stretch your legs. 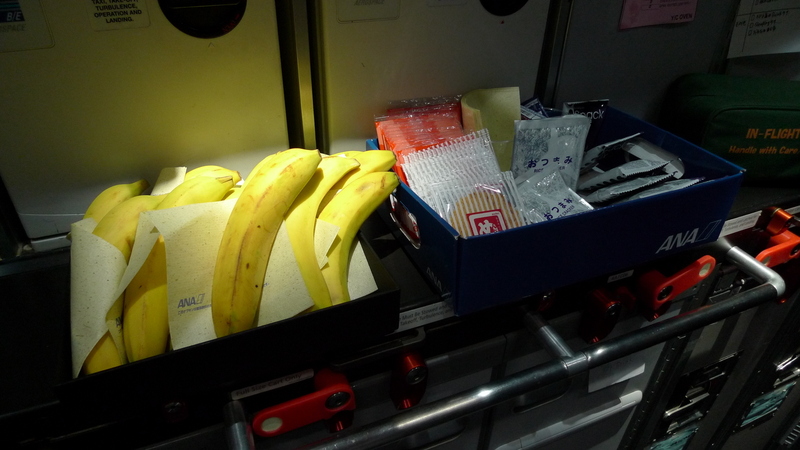 Also in the galley was a basket of snacks and beverages with a sign inviting you to help yourself. 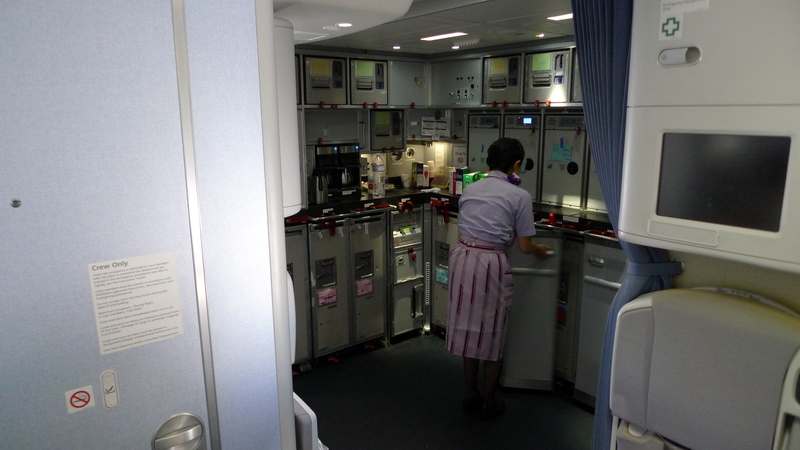 Flight attendants were also available to take care of any requests, such as brewing a cup of tea for me. 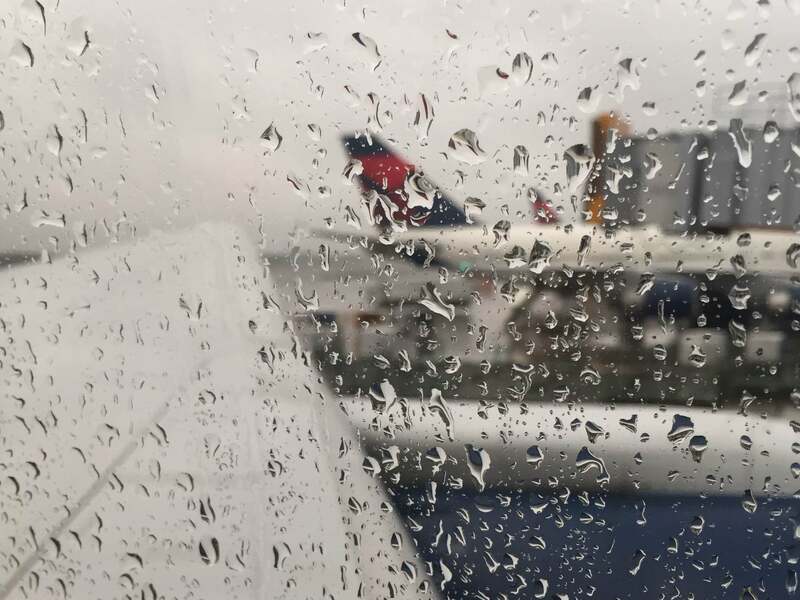 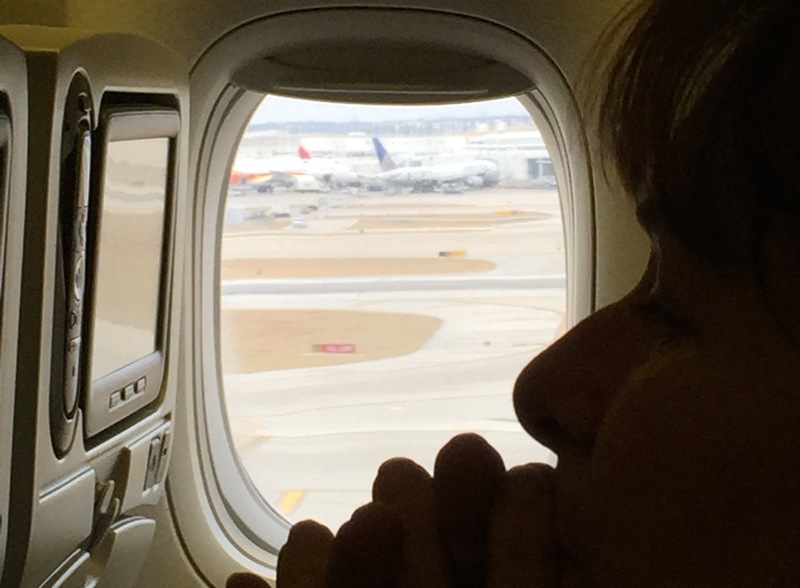 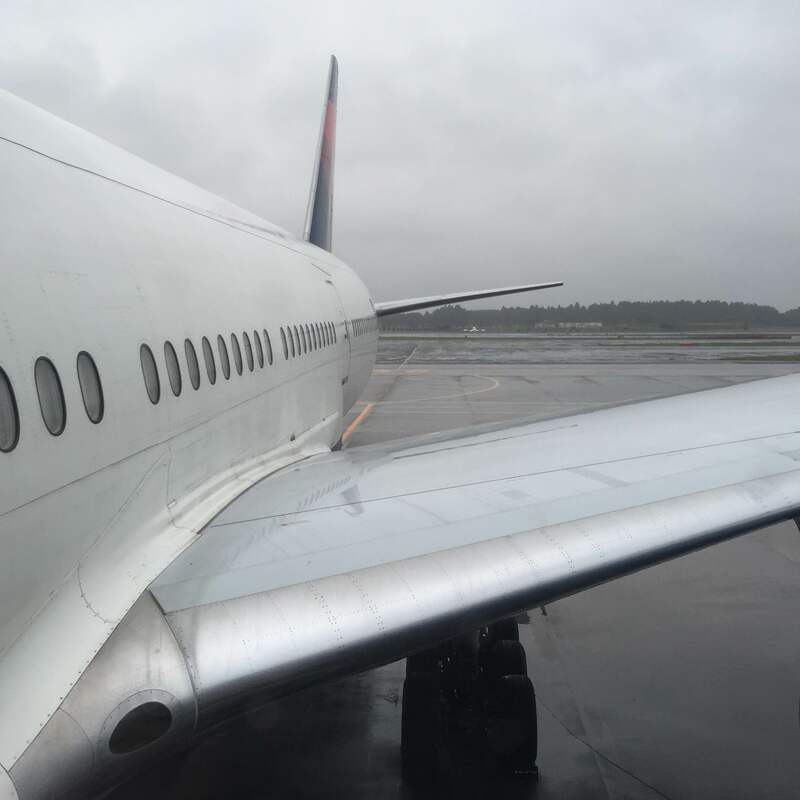 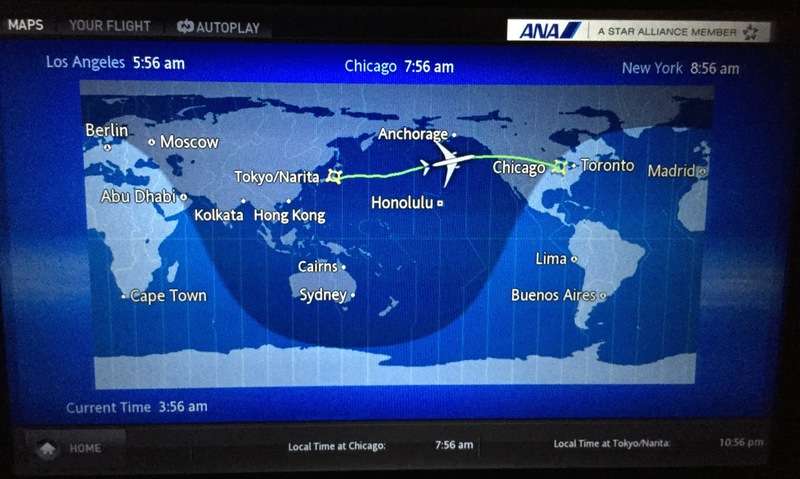 With strong east-bound tail winds, our flight to Chicago was only 10:30 minutes. 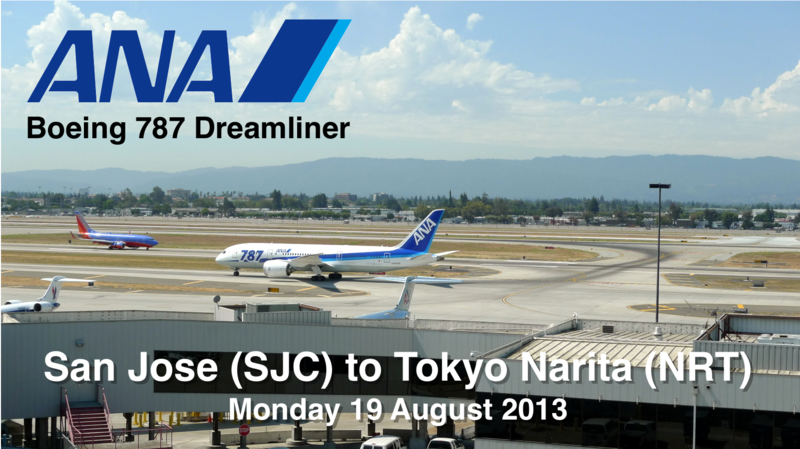 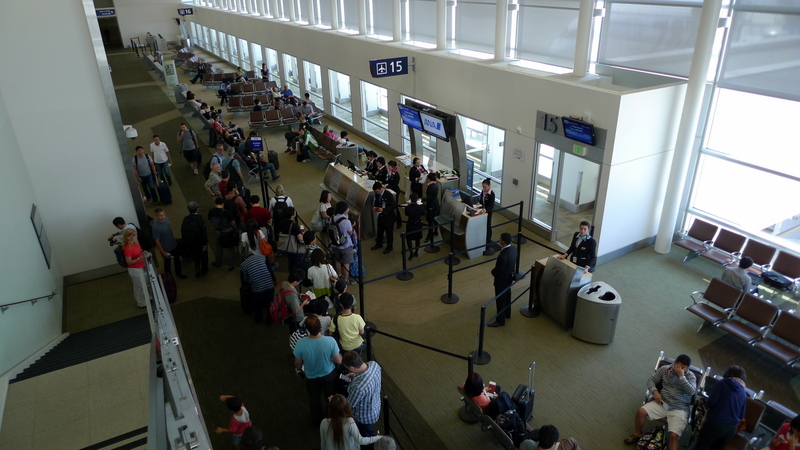 The return flight from San Jose to Tokyo, a much shorter route, was actually fifteen minutes longer! 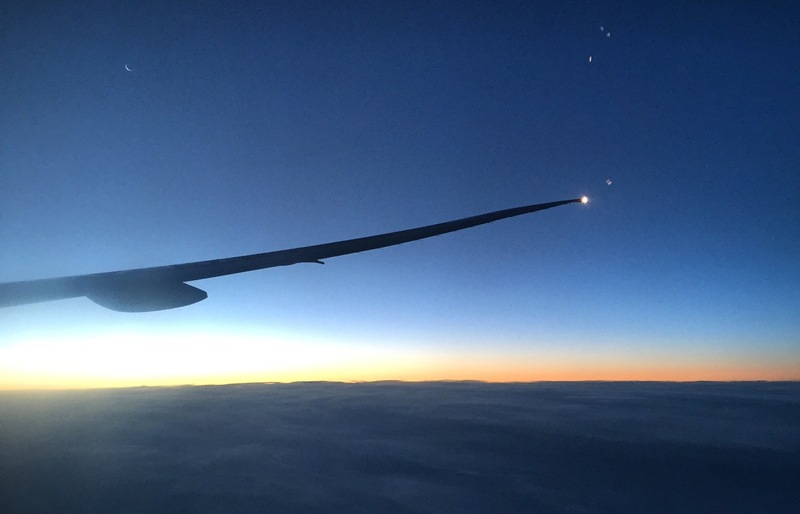 Our second sunrise of the day, the first viewed while we were on the ground in Bangkok and the second viewed off the coast of Washington. 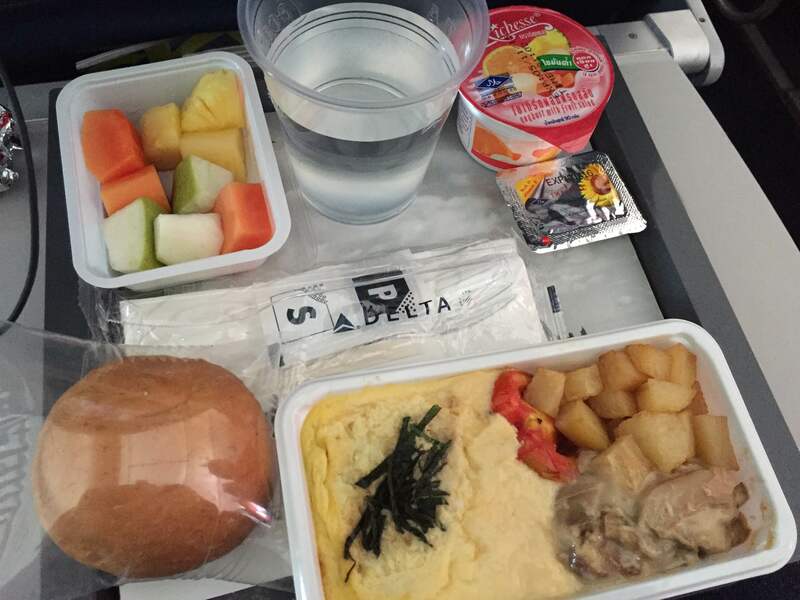 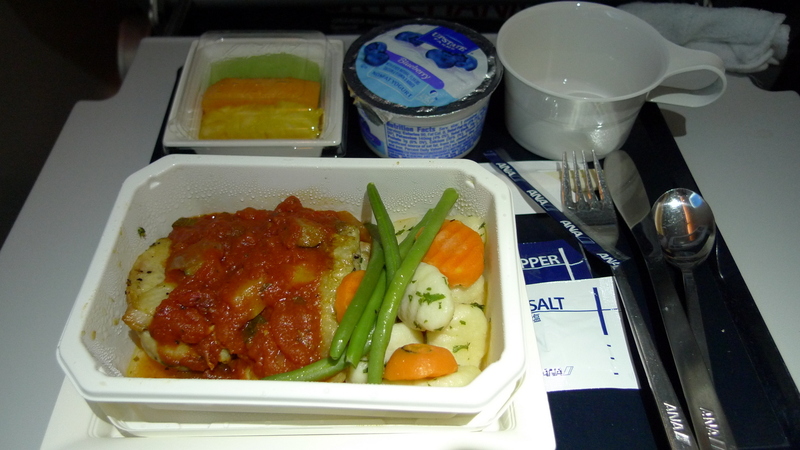 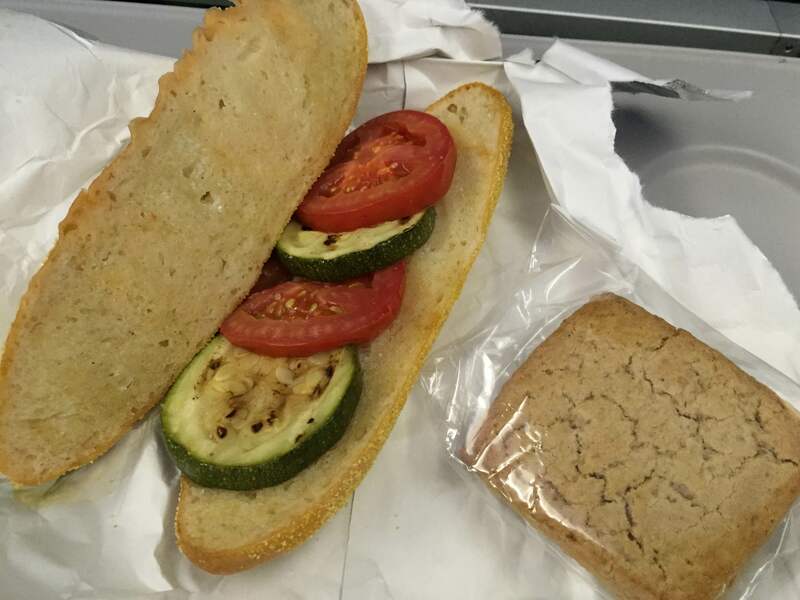 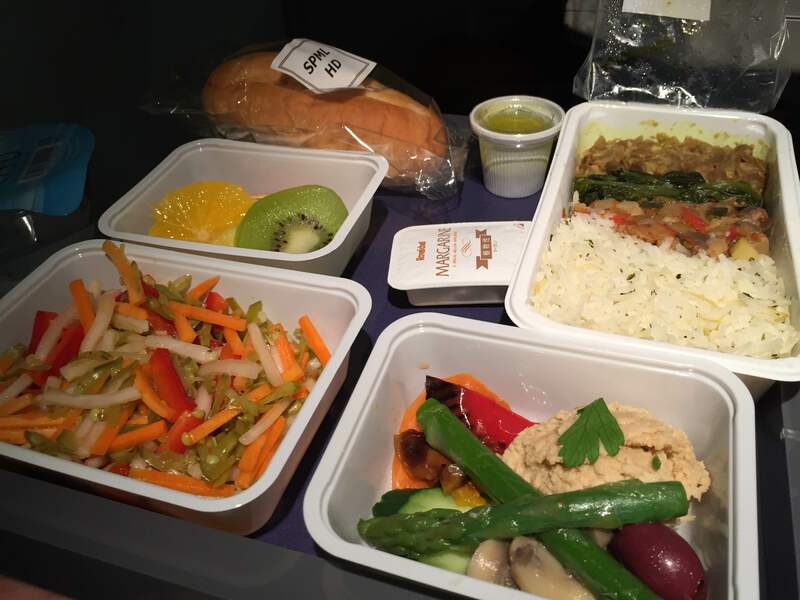 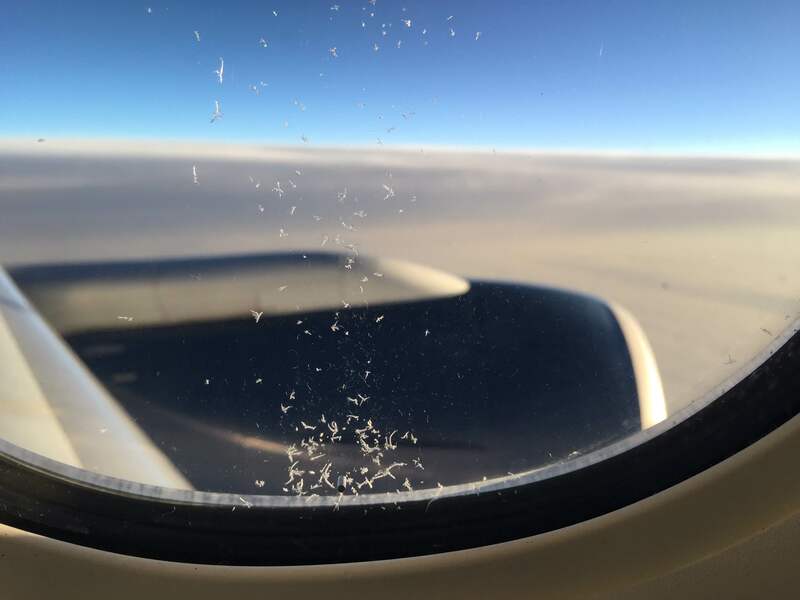 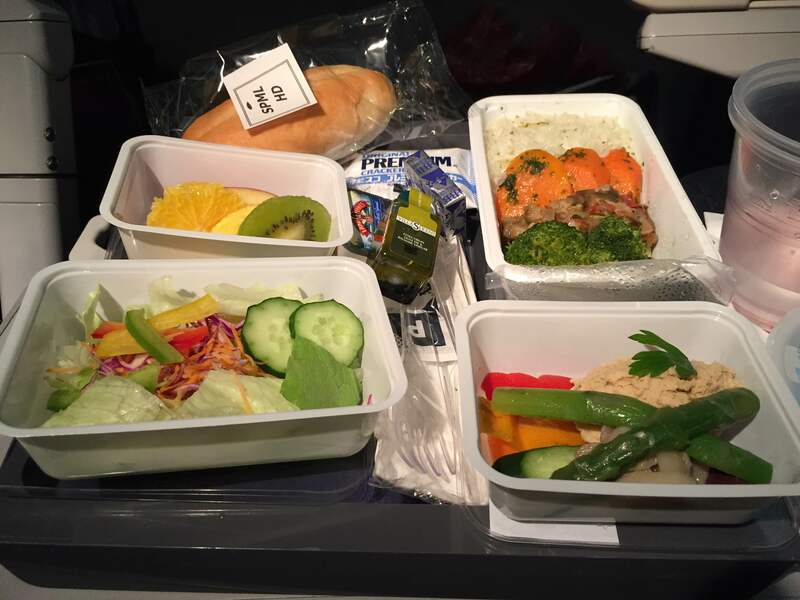 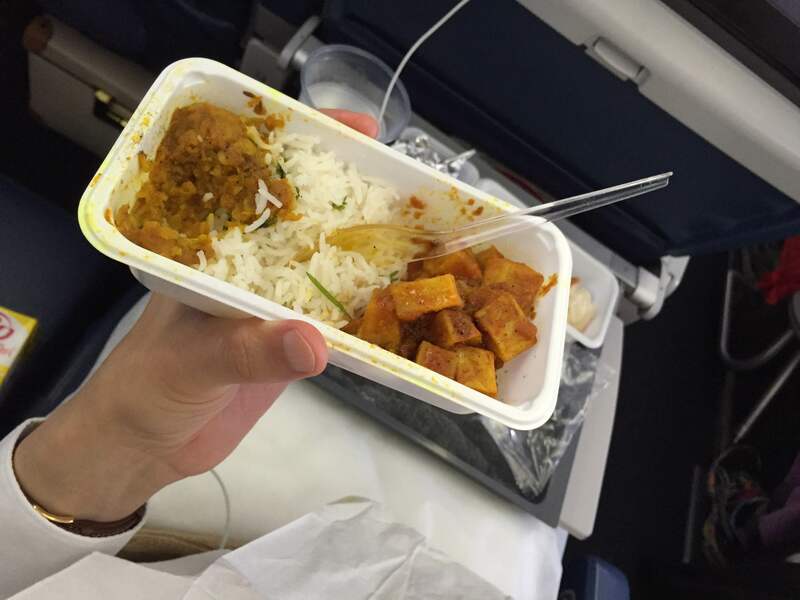 About 90 minutes before landing, a second meal was served. 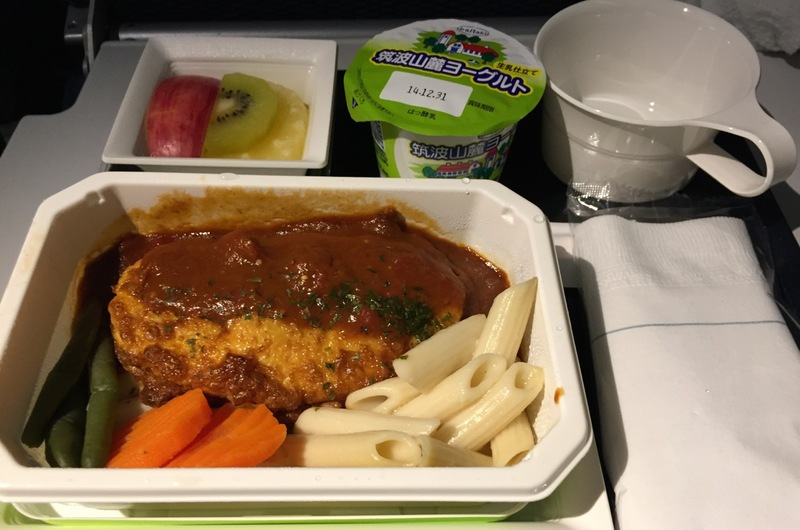 This is the minced chicken with noodles (I think!) 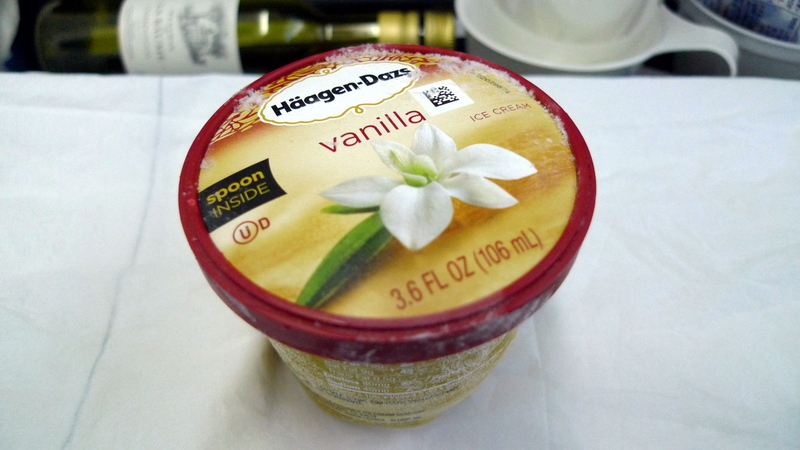 that Tawn had. 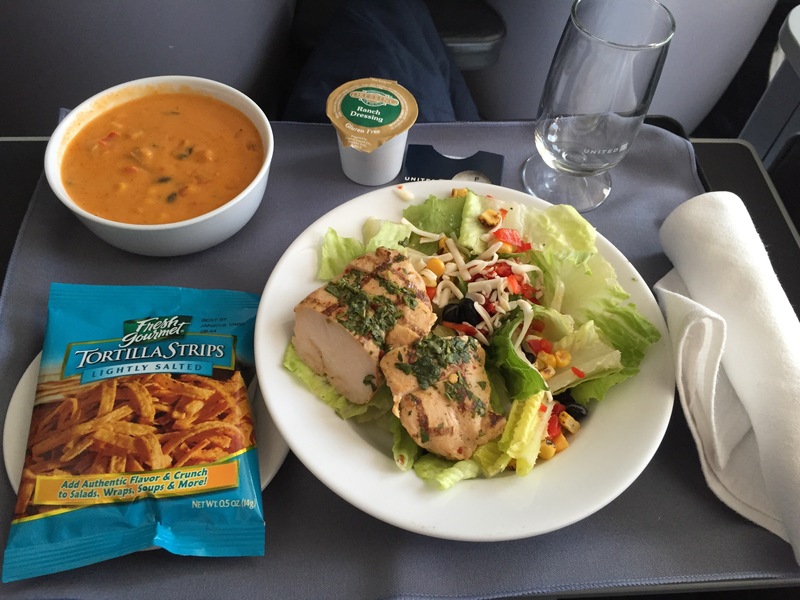 And I had a chicken thigh served with pasta. 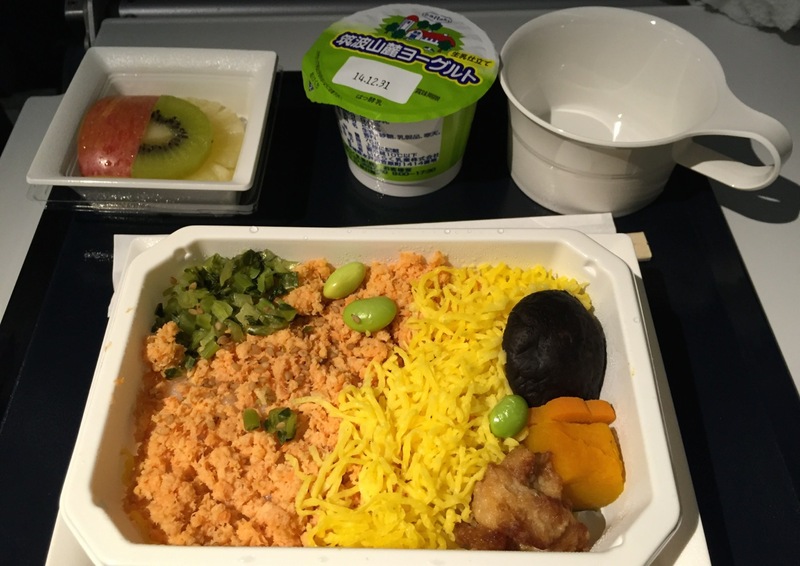 These meals were a bit lighter than the first meals, but appropriate given that we had departed in the evening and were arriving just after lunchtime. 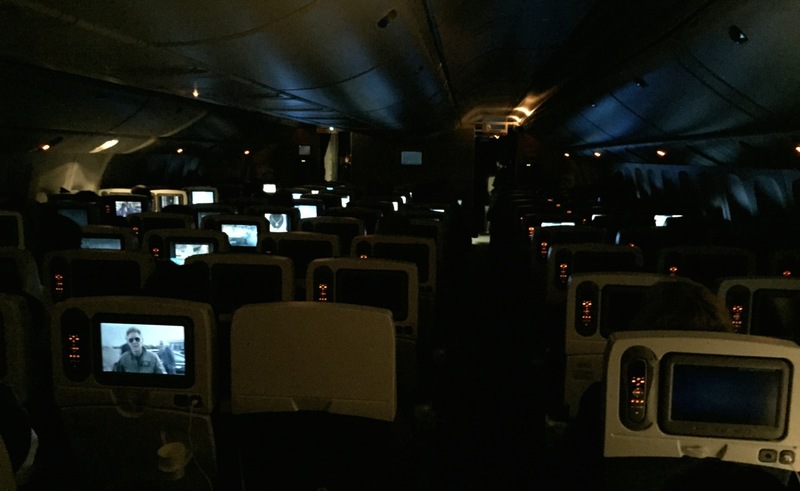 The cabin with the lights on. 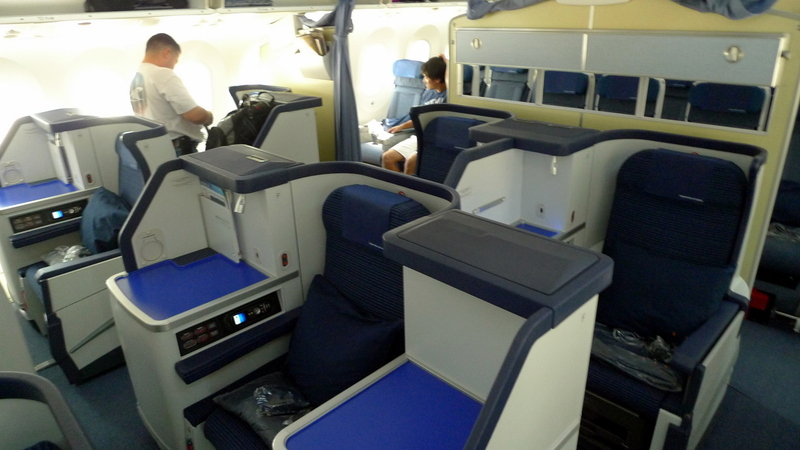 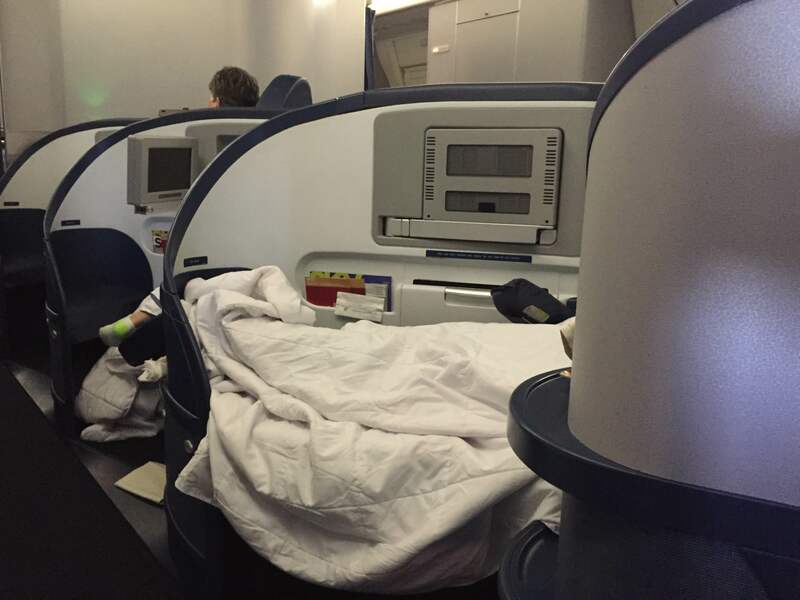 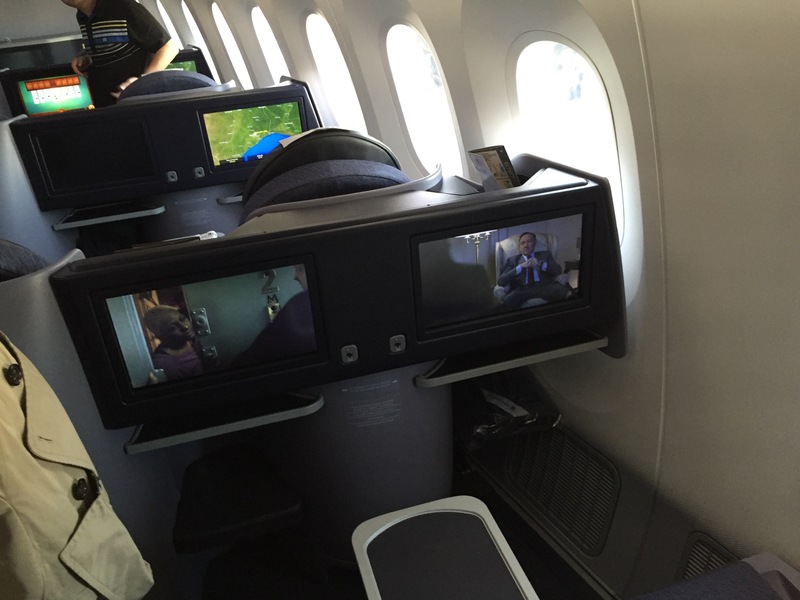 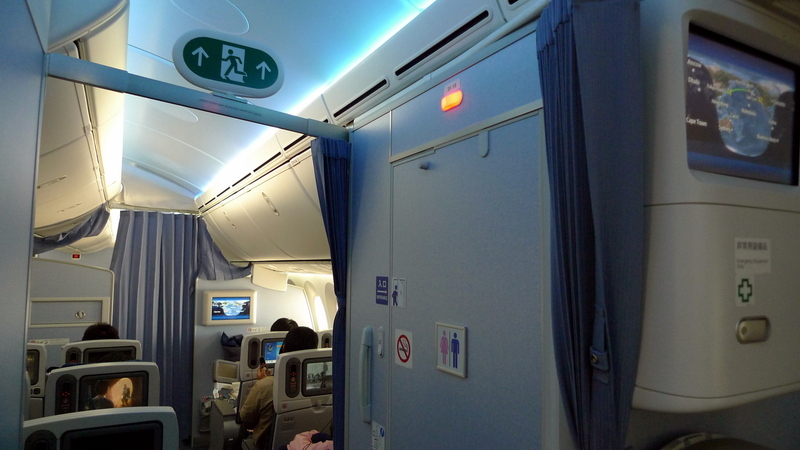 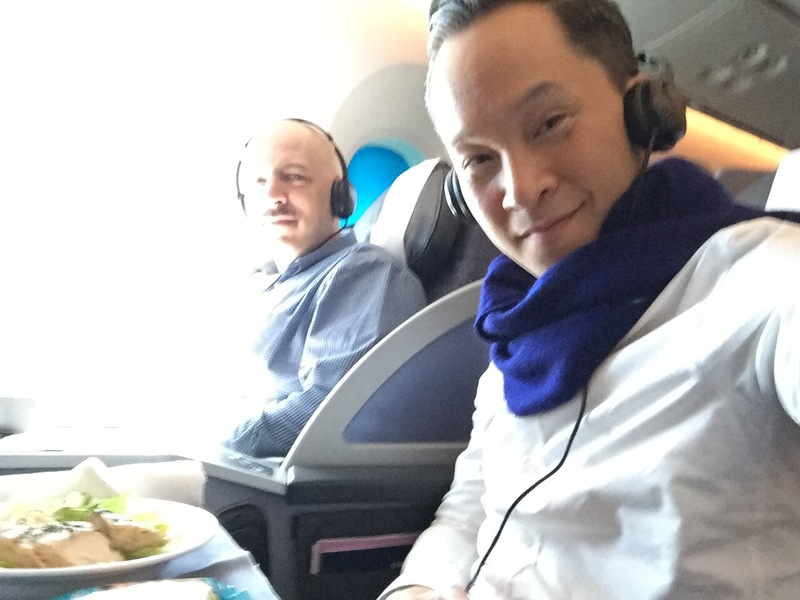 It is actually a comfortable enough cabin to fly in, even for the long haul flight. 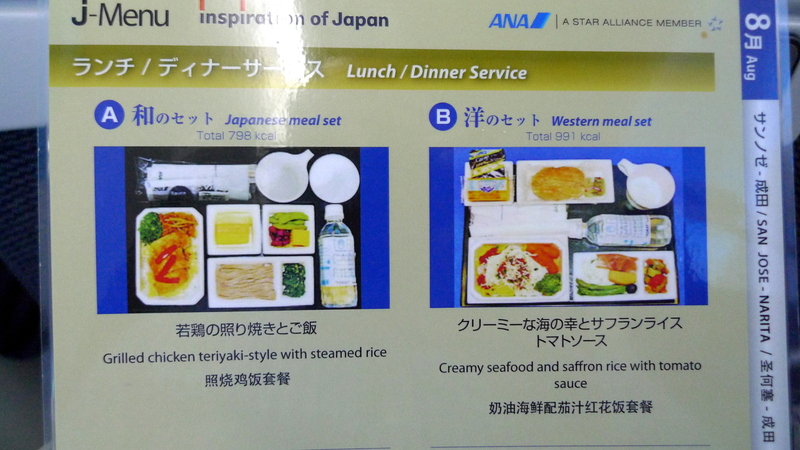 Sure, business class would be better, but for the price, All-Nippon economy class was fine. 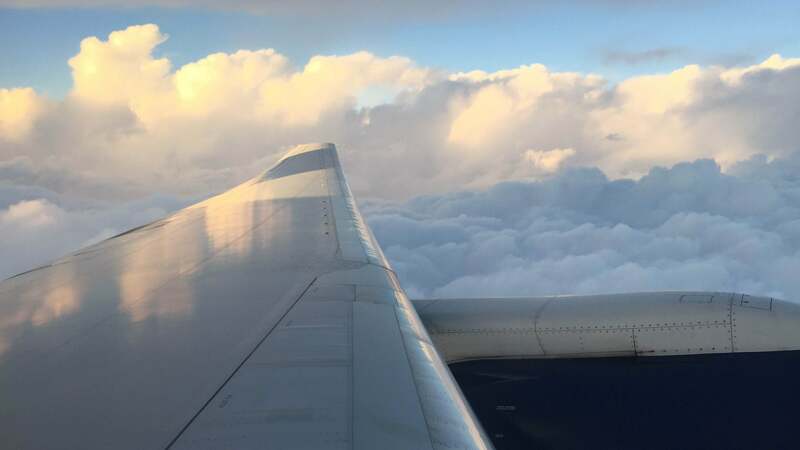 About five seconds before landing, a view across the plane and out the window, where you can see planes at the international terminal where we would disembark.